We feel proud to announce the introduction of ZIMMER BIOMET Dental Implants from USA in addition to the already available NOBEL BIOCARE system. 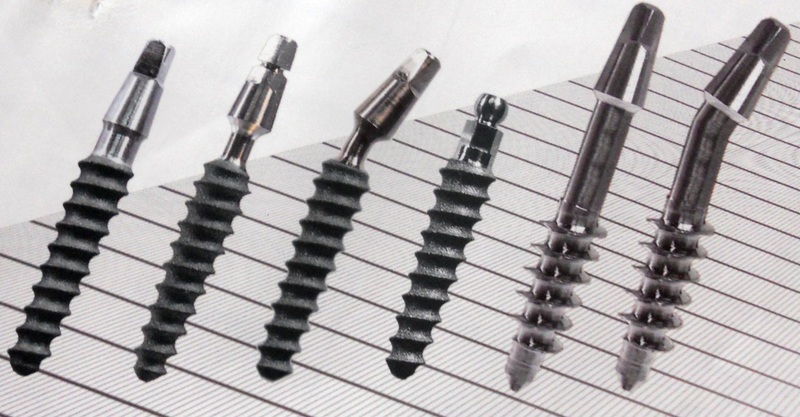 Both these systems fall in the category of the top 5 Dental Implant Systems in the World. 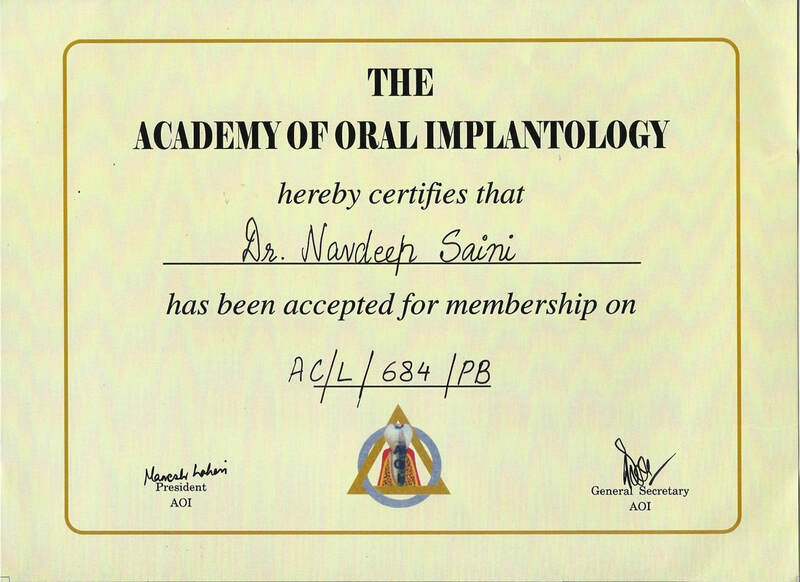 We at SAINI`S DENTAL CARE & IMPLANTS CENTRE have undergone extensive training in the field of Implantology & continue to upgrade our knowledge both in India & abroad & are using a number of Implant Systems like NOBEL BIOCARE, UNITI EQUINOX, ADIN, KOS, BCS, BOI since 2008 & are able to handle all cases requiring implant supported teeth. We have our own equipment & place & restore implants ourselves, unlike many of our colleagues who are neither trained nor place & restore implants themselves, but , ask other Dentists ( who come from some other city ) to place implants for them. 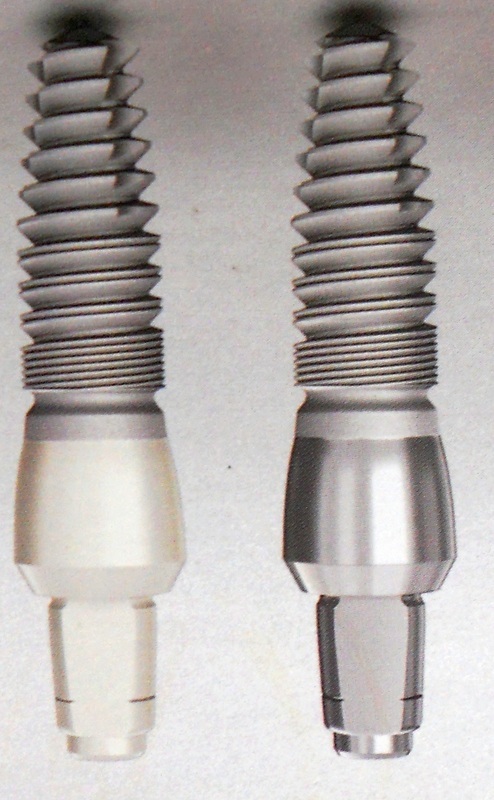 Typical two piece implant system -where in the implant & the abutment are two separate components which are connected & then a crown is placed on the abutment. Two piece implant with a tooth color abutment. An inside view of the joint between the implant & the abutment in the Two Piece Implant System. 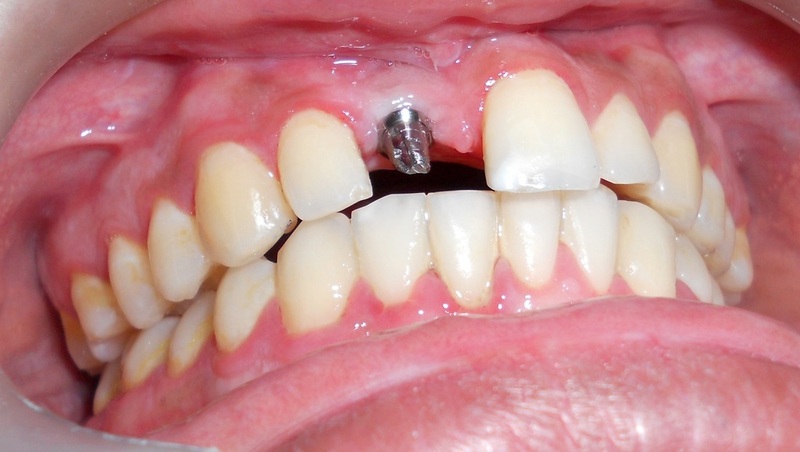 One piece implant with a tooth color & a regular titanium abutment. 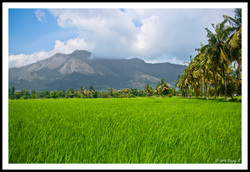 One Piece Implants by Adin Implants. 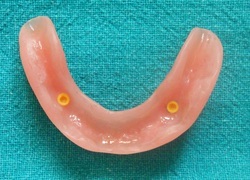 A single piece Ball Implant for an overdenture. A triple disc BOI Implant. 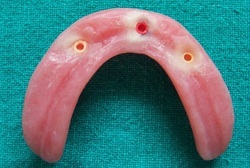 Laterally inserted single disc BOI Implant. 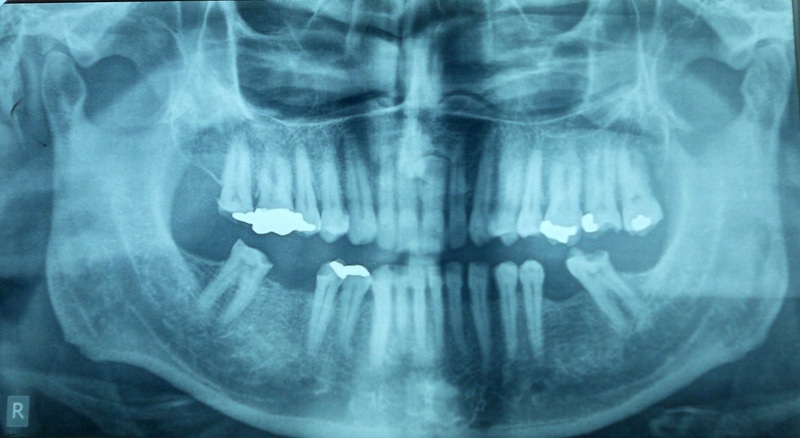 KOS Plus Implant which engages both Cortical & Cancellous Bone & has very high immediate stability. 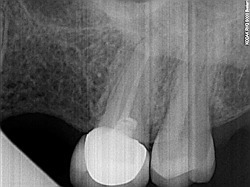 BAST Implant from Dr Ihde Dental. 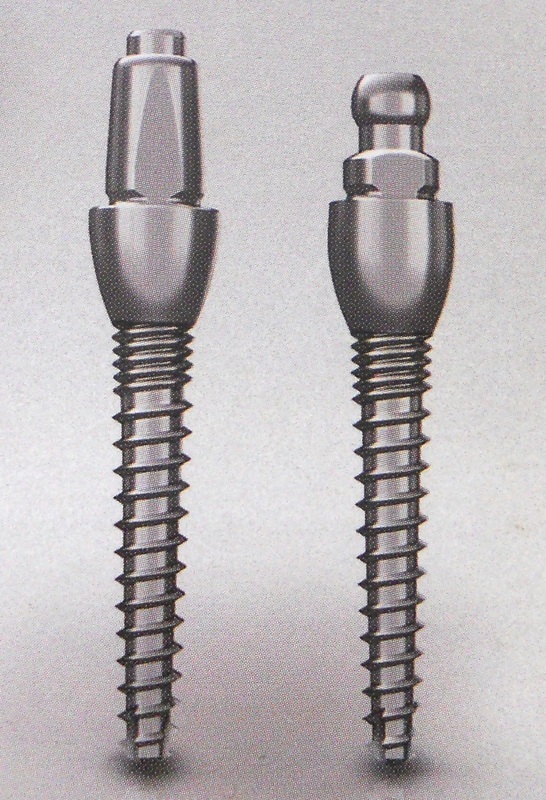 Image of a Double Disc BOI Implant. 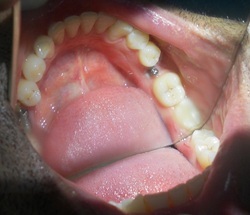 A Tubero Pterygoid Implant placement. 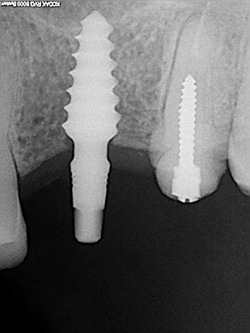 Some examples of use of KOS Plus Implants. 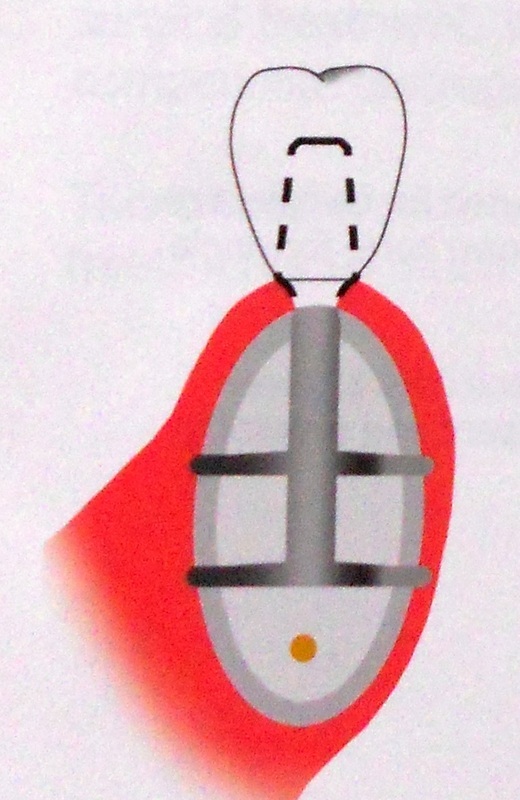 Method of insertion of BOI Implants. 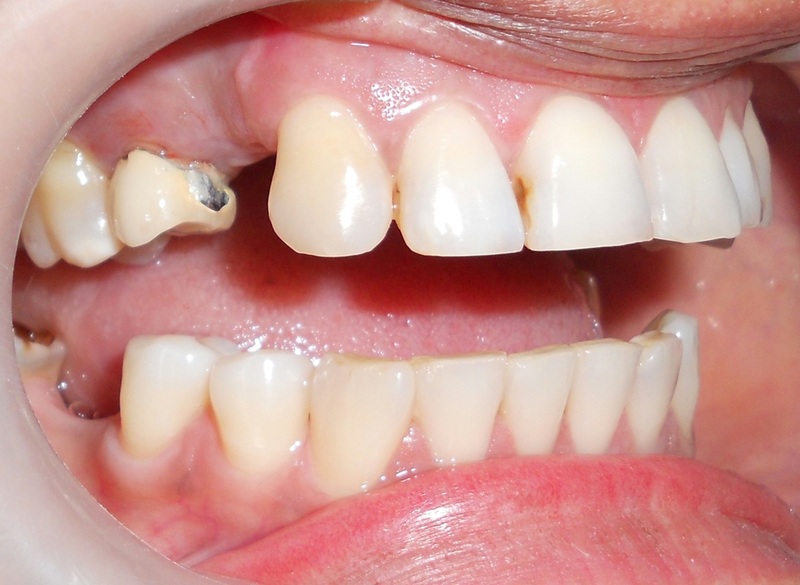 WE CAN PROVIDE YOU IMPLANT SUPPORTED FIXED TEETH WITHIN ONE TO TWO DAYS . 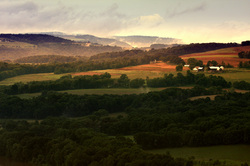 -the part which goes into the bone that is called the implant . 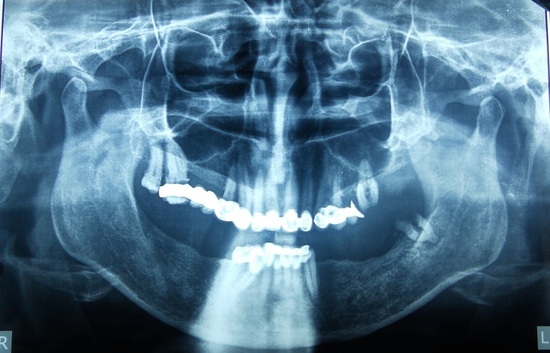 It is equivalent to the root of a natural tooth & acts as an anchor –by mechanically & biologically bonding with the jaw bone – a process called OSSEOINTEGRATION . 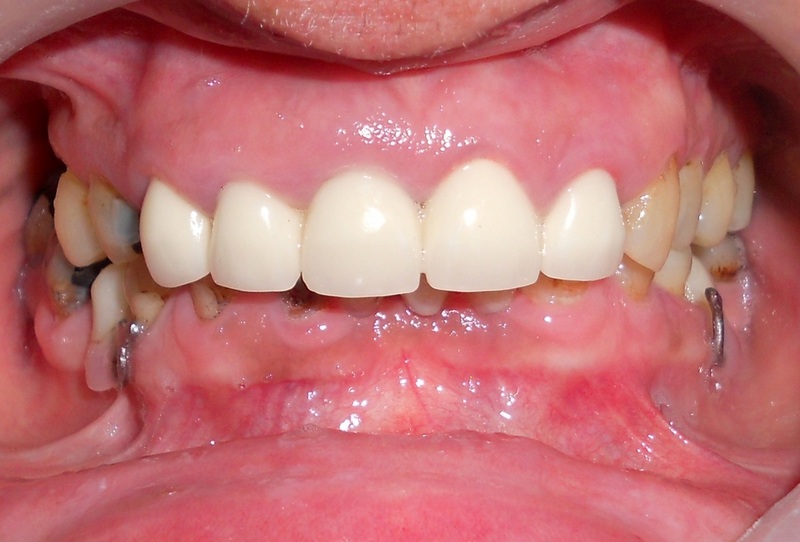 - the part which is visible in the mouth & on which the crown/ cap is fixed that is called the abutment . 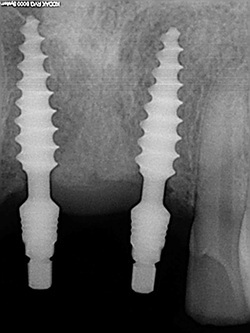 Two Piece Implants : Here the implant & the abutment are two separate pieces . 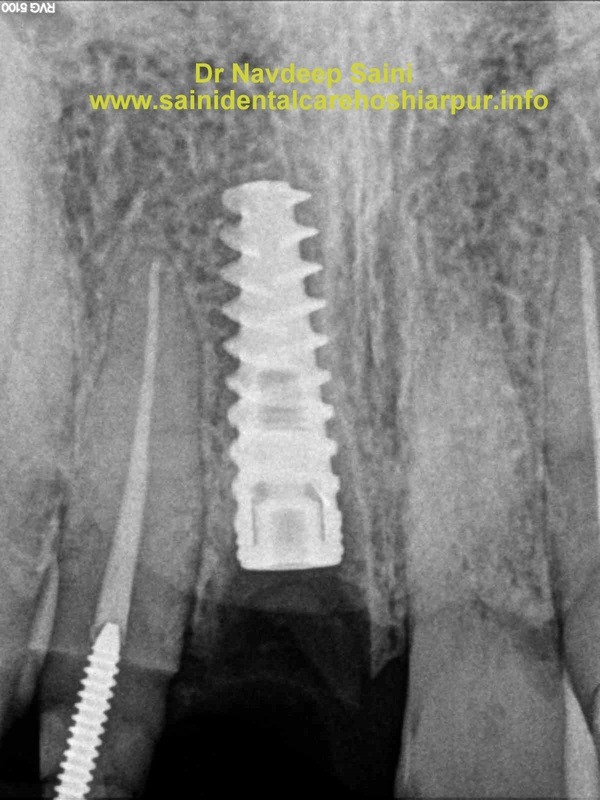 The implant body is hollow & the abutment is inserted into the body of the implant & is held there with a screw or by a friction grip Morse taper mechanism .They can be placed in already healed bone or in fresh extraction sockets . The abutment can be straight or angled. 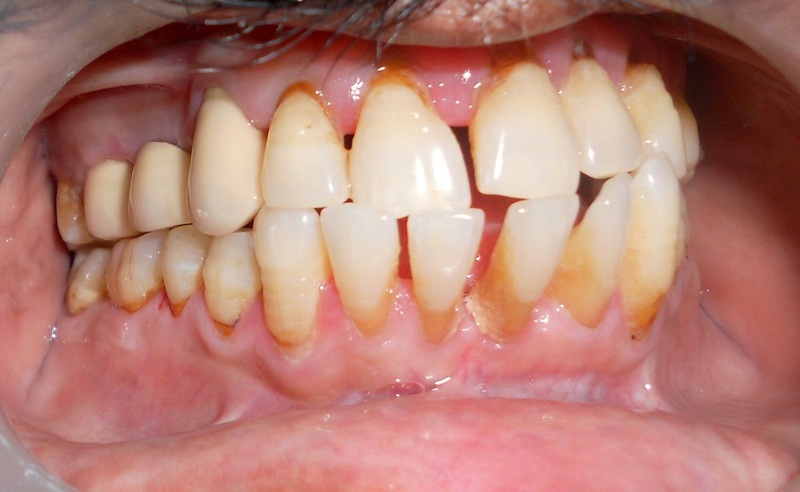 It can be tooth colored or non tooth colored . 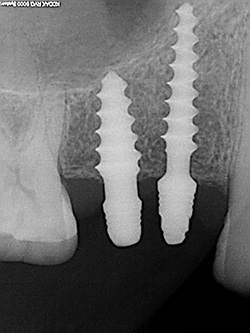 One Piece Implants: Here both the implant & the abutment are one solid piece of metal & are inseparable . 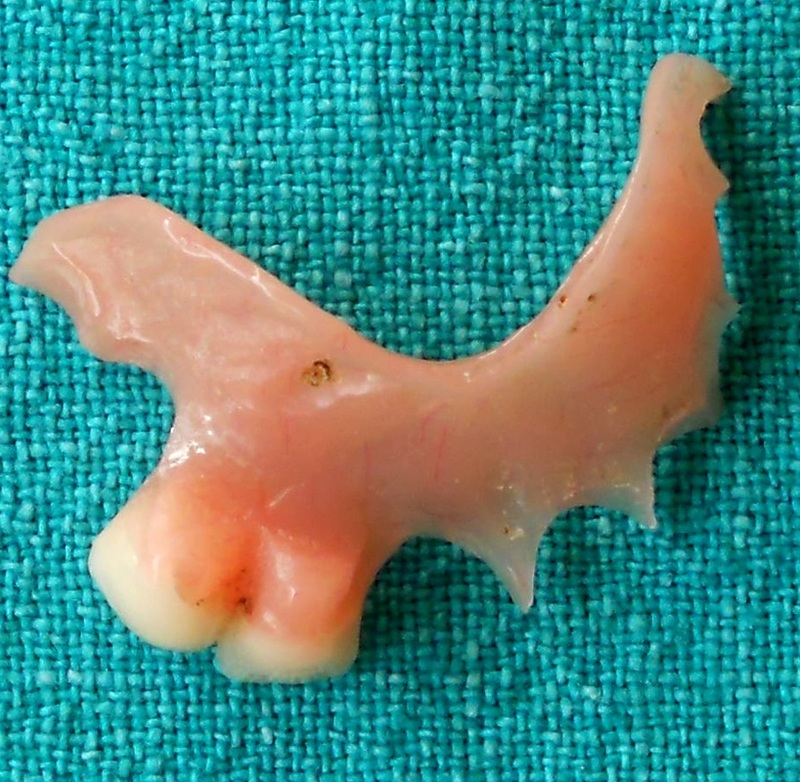 They can be inserted in already healed jaw bone or in fresh extraction sockets . 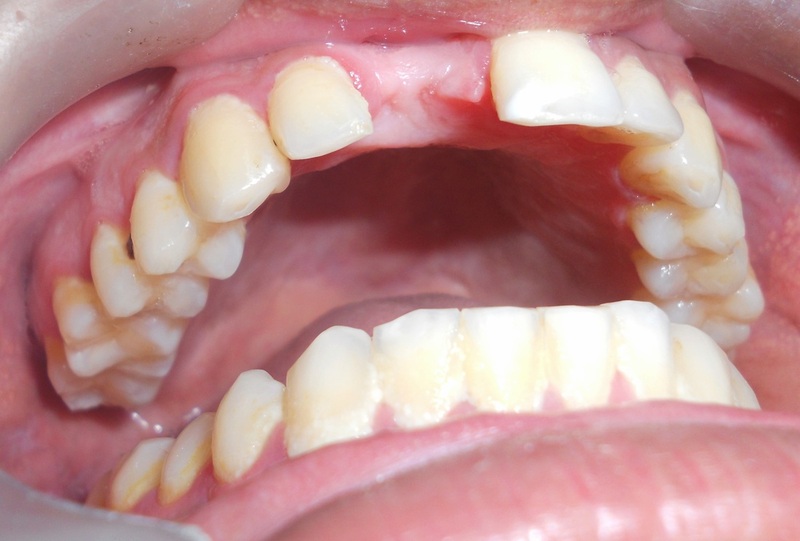 The abutment can be pre angulated or can be bent to achieve a favorable angulation . 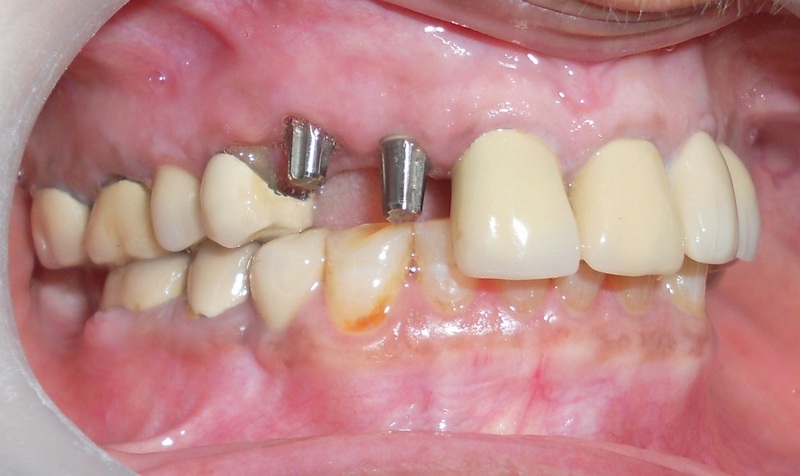 The ball type one piece implants are used for stabilizing Complete Dentures . 1. Only the implant is inserted into the jaw bone & the abutment is added after about four months or later & then a temporary or permanent crown is attached . 2. 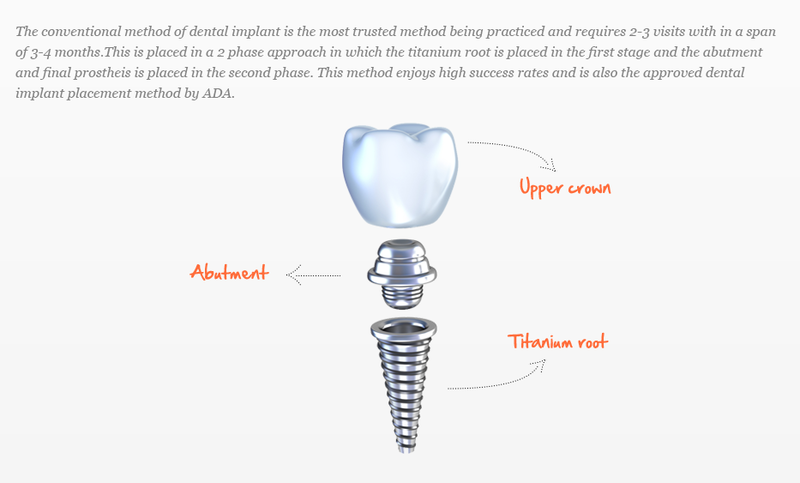 The implant is inserted , the abutment is added there & then & a temporary crown is attached . 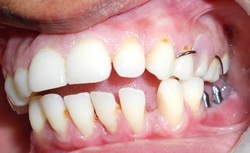 This temporary crown is later on replaced with a permanent crown . 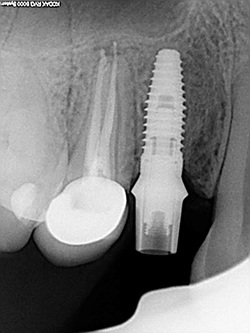 For one piece implants temporary or permanent crown is placed within a day or so of implant insertion . 1. Get a number of implants fixed & get crowns fixed on them . These can not be taken out by the patient . 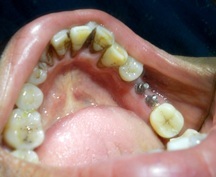 They can be removed only by a dentist for service / cleaning / repair/ replacement . 2. 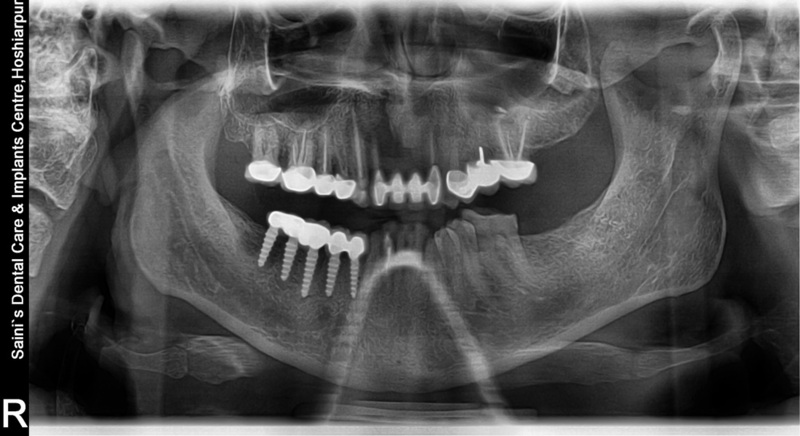 Get two to four ball implants / normal implants with locator attachments or bars fitted in each jaw . 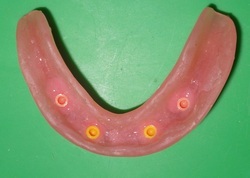 The Complete Dentures can be easily attached to these implants by the patient . 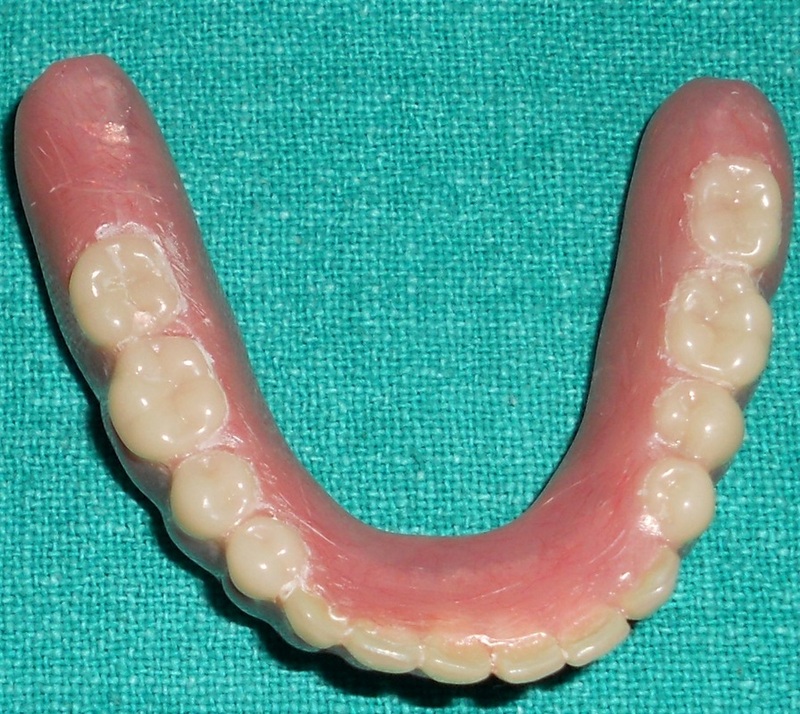 These dentures are called Implant Supported Overdentures . The patient can eat any food of choice , talk & smile confidently without the risk of the denture moving in the mouth & causing mouth sores & embarrassment. 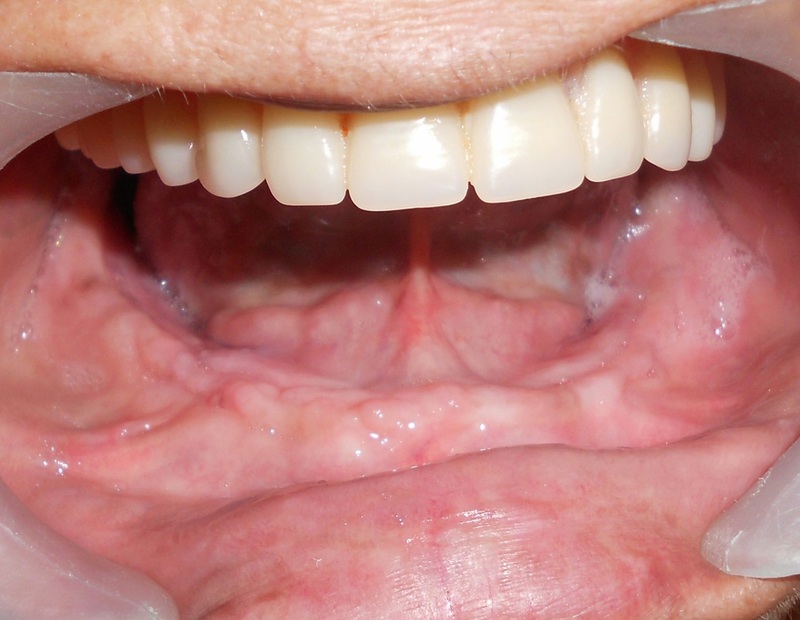 The dentures can be easily removed by the patient, cleaned & fixed back in the mouth. 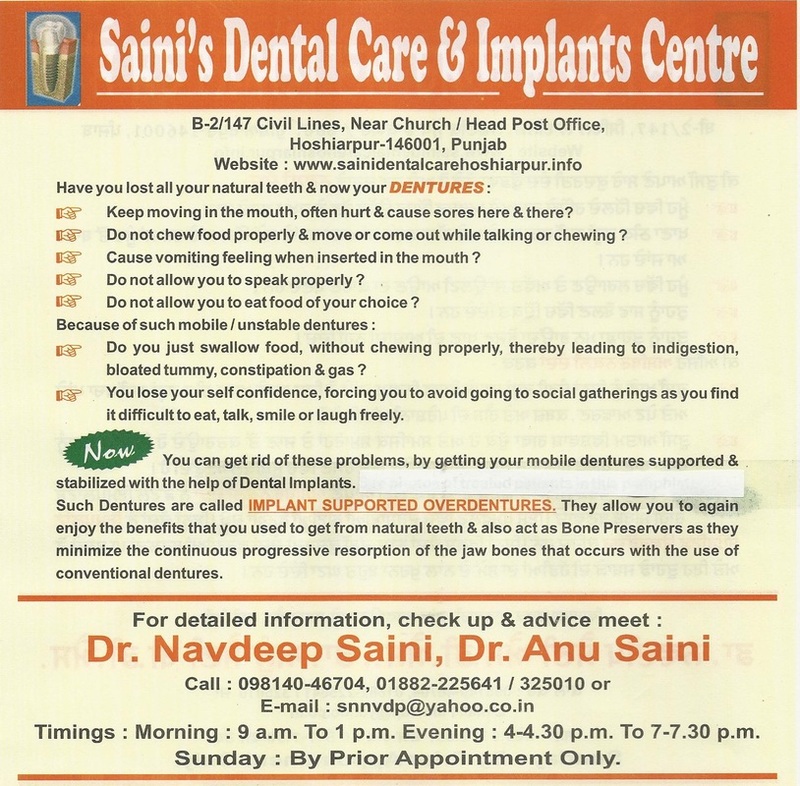 knowledge by the Dental Surgeon – Implantologist & his/ her team. 2. Proper Equipment for the various procedures. 3. 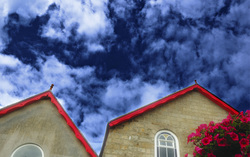 Proper diagnosis of the situation & treatment planning. 4. A stock of a variety implants/ abutments etc. 5. Confidence of handling various situations. Costs include the price of Implant / Abutment, temporary/ permanent crown. 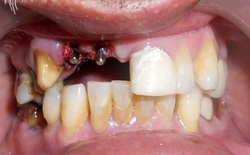 The use of Bone graft material, membrane etc add to the costs of treatment. There are many companies manufacturing & selling Implantology related materials. The costs vary from company to company & the type of implant ,the type of abutment – according to their cost inputs,quality, Research & Development, advertisement budget & market share. 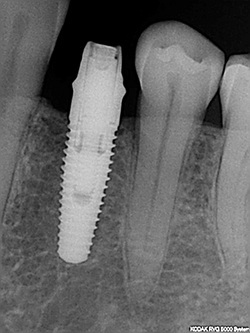 Generally one piece implants are cheaper than two piece implants. 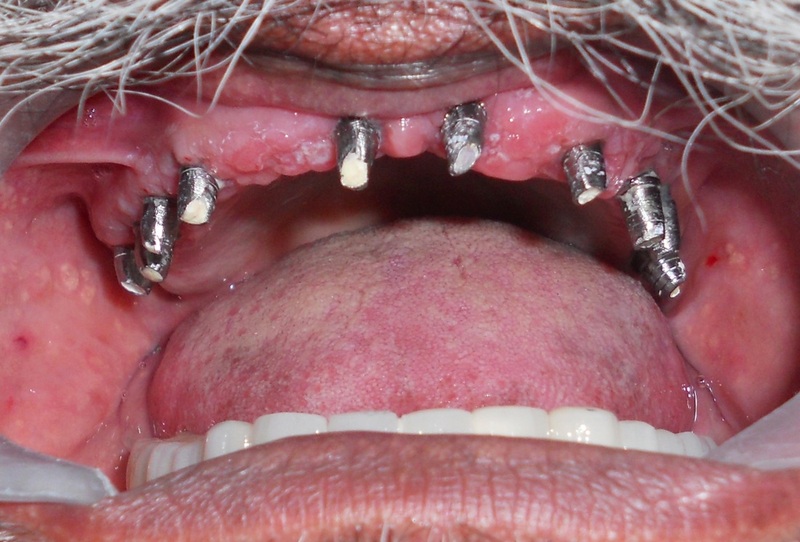 CASE REPORT: This 56 years old male patient from Toronto, Canada, was using Upper & Lower Complete Dentures, but, wanted fixed teeth.Two Piece - Eight Equinox Myriad Plus Implants( Equinox Medical Technologies, Holland) were placed in the lower jaw and 10 ADIN Implants (Israel) were placed in the upper jaw. 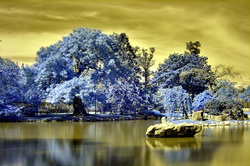 Porcelain Fused to Metal Bridges were cemented. 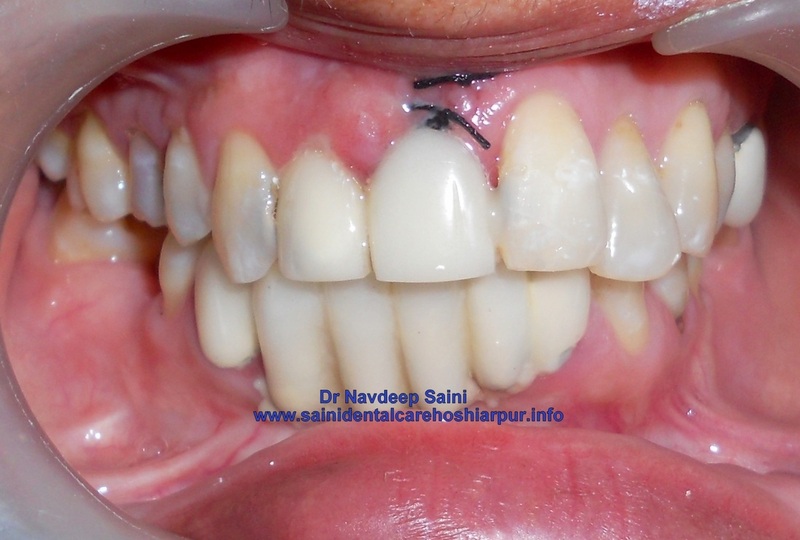 The patient is extremely happy & satisfied with the outcome. 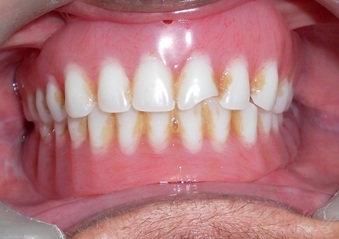 Pre Treatment Intra Oral Picture - Upper Ridge. 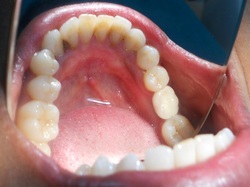 Pre Treatment Intra Oral Picture- Lower Ridge. 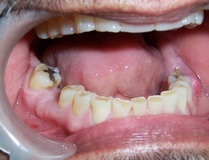 Post Treatment Intra Oral Picture. 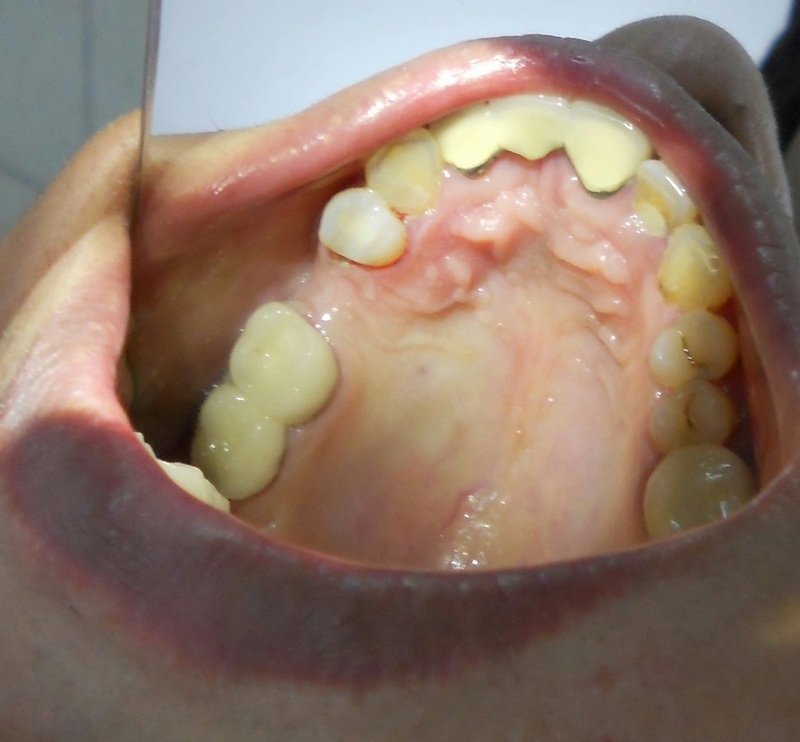 NEXT CASE REPORT: This 69 years old female patient from San Jose,California, USA, was using upper & lower full dentures, but, was not comfortable with the lower denture as it kept on moving & hurting. 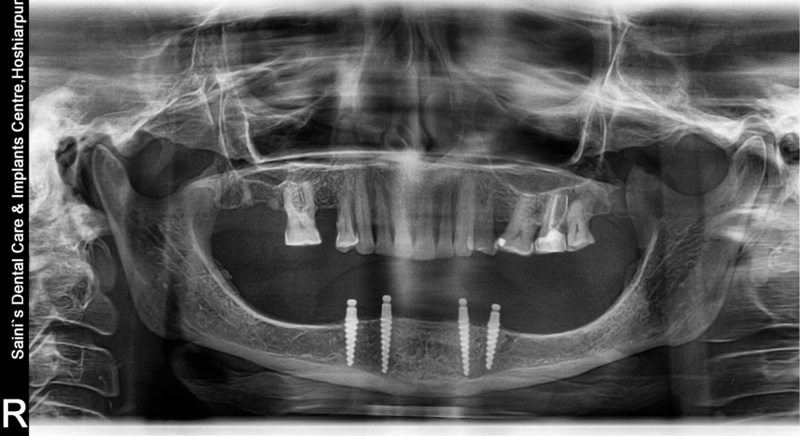 One Piece KOS / BCS Implants from Dr. Ihde Dental, Switzerland / Germany were placed in the lower jaw & Metal Acrylic Hybrid Prostheses was cemented. The patient now feels very comfortable to chew food/ speak/ laugh. 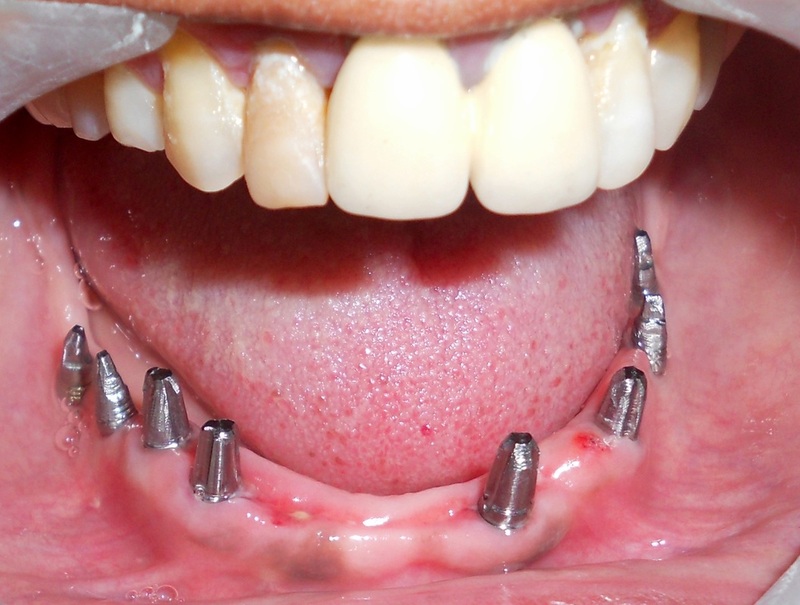 Metal Acrylic Prostheses prior to cementation. 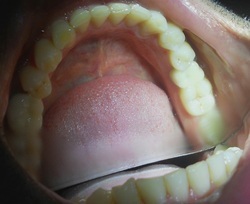 Fitting Surface of Lower Full Denture being used by the patient. 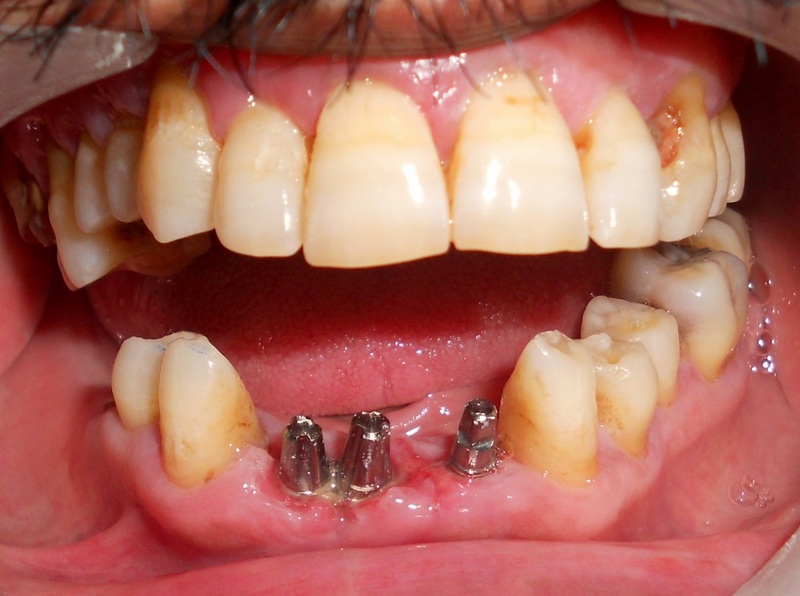 Metal Acrylic Hybrid prostheses after cementation. 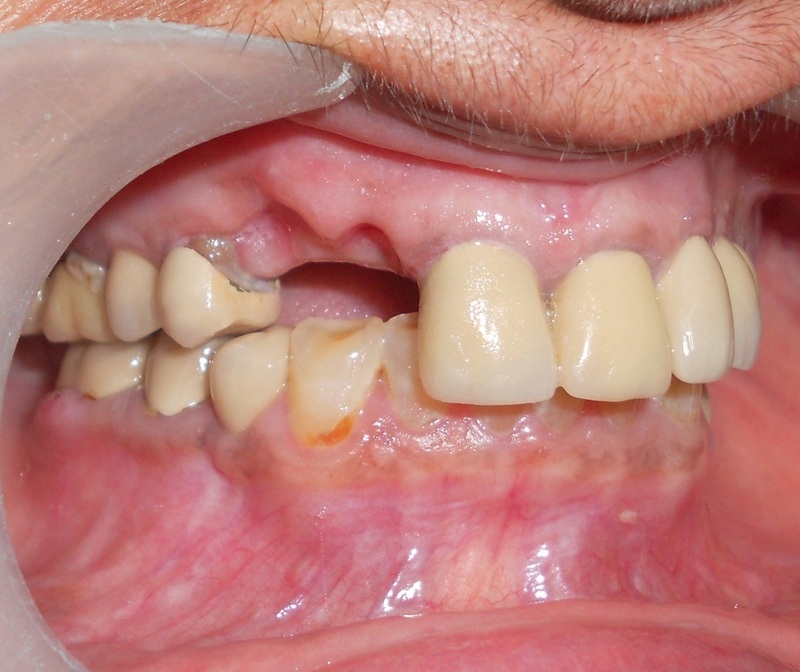 NEXT CASE REPORT: This 67 years old male patient from Toronto, Canada, was using a cast partial denture in the lower jaw & a full denture in the upper jaw. 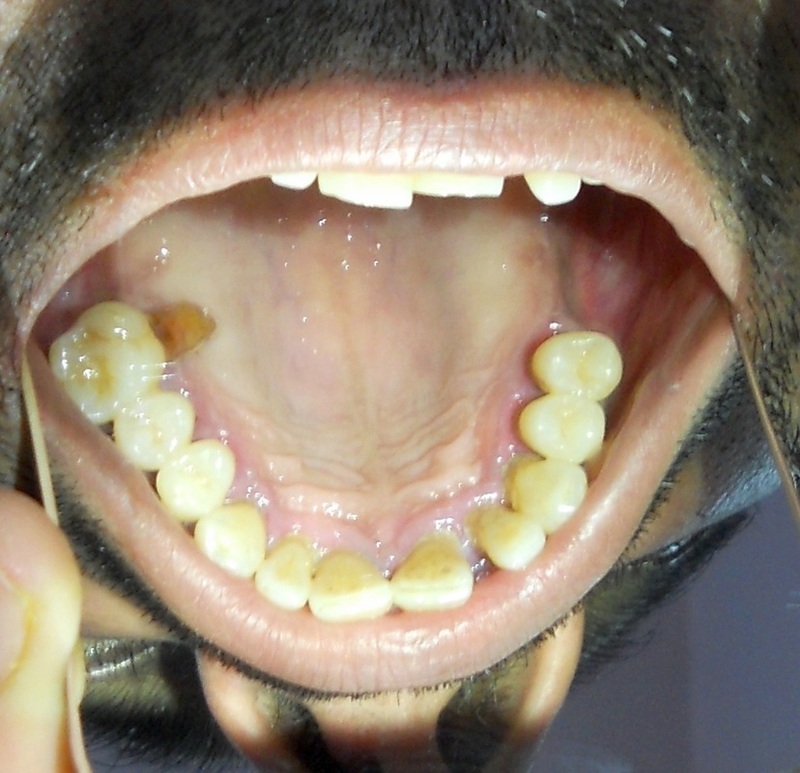 Most of the remaining natural teeth in the lower jaw were grossly destructed. 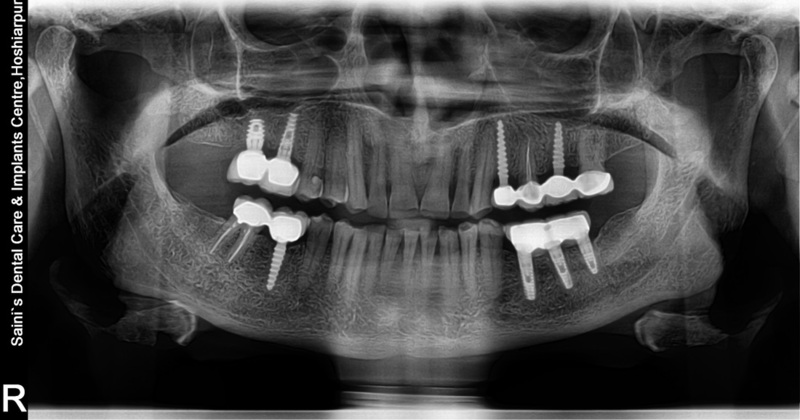 All the lower teeth were extracted &One Piece KOS / BCS Implants from Dr. Ihde Dental, Switzerland / Germany were placed. Immediate chairside Acrylic Temporary bridge was delivered. 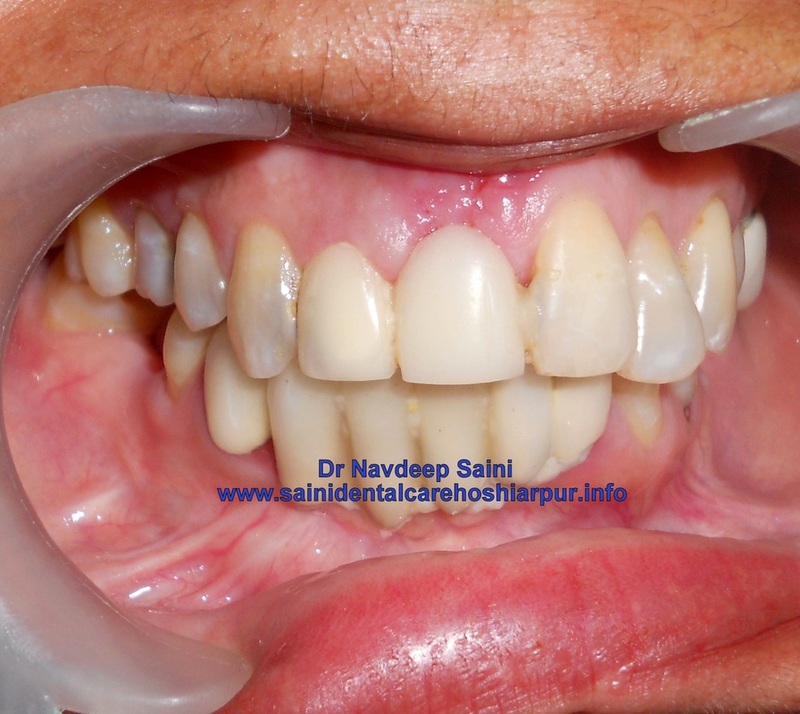 Metal Acrylic Hybrid Prostheses was cemented in the lower jaw & a New Upper Complete denture was fabricated.The patient is extremely happy & satisfied with the outcome. Follow up E Mail & reply. I hope this email finds you and your family members in the best of health and spirits. I wish to know about your general and dental health and hope that you are totally comfortable with the new teeth. Kindly do reply back. I was thinking of sending you email one of these days but now I am glad you have send me one and has forced me to reply. you have already seen, will be coming for upper and lower jaw implants. One again Doctor, thanks and convey my best wishes and regards to your family and staff. 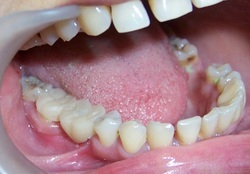 Pre Treatment Intra Oral picture. 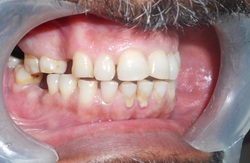 Pre Treatment Intraoral picture without partial denture in place. 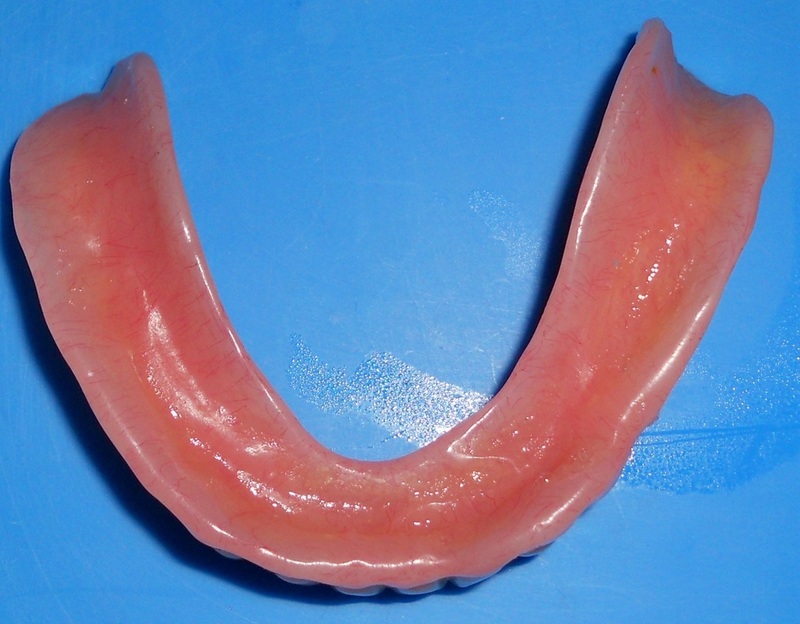 Picture of Lower cast partial denture. 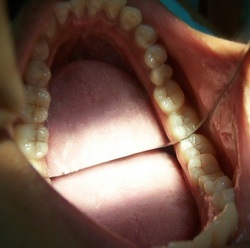 Intraoral picture on the day of surgery. 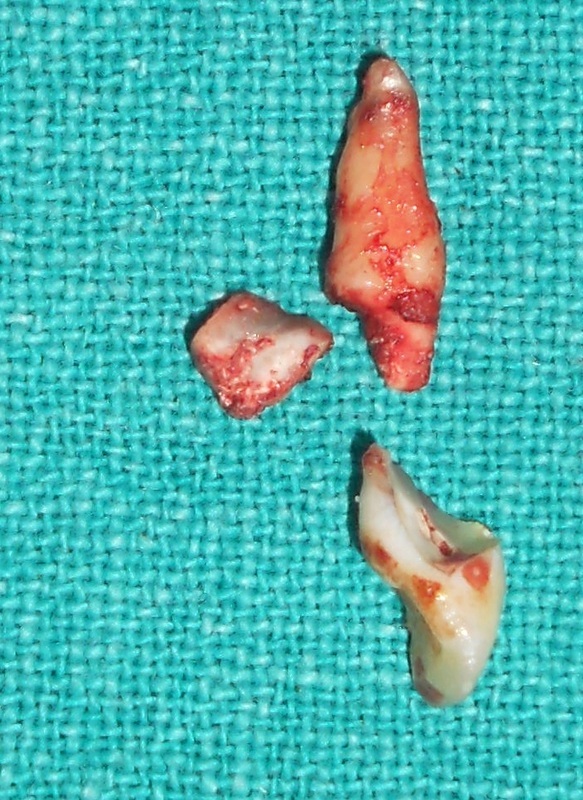 Picture of the extracted teeth. Chairside Acrylic Temporary prostheses in place. 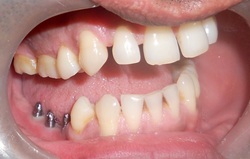 Lower Metal Acrylic Prostheses before cementation. 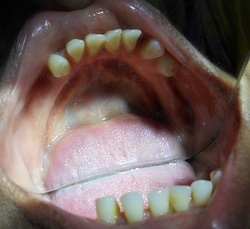 Intra Oral picture after prostheses delivery. Intra Oral Picture on the fourth day. 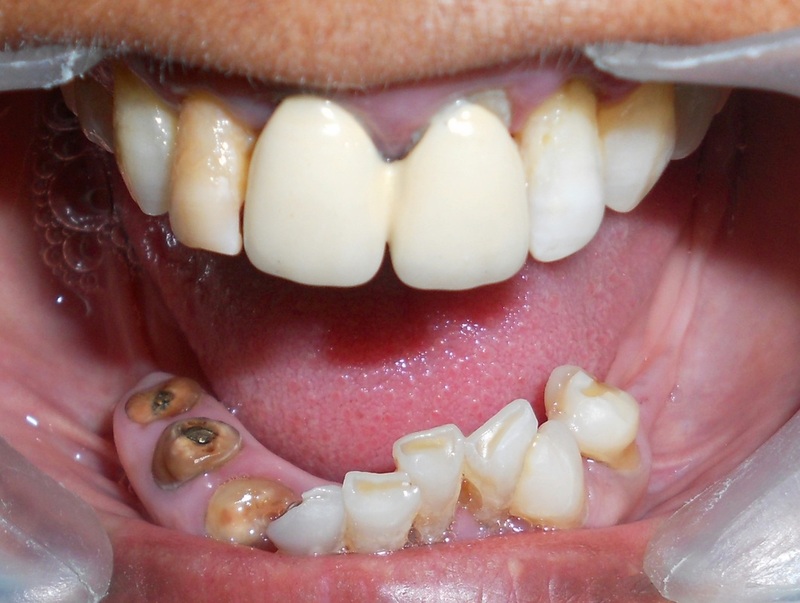 Next Case Report: This 57 years old female from United Kingdom, reported with multiple missing teeth. 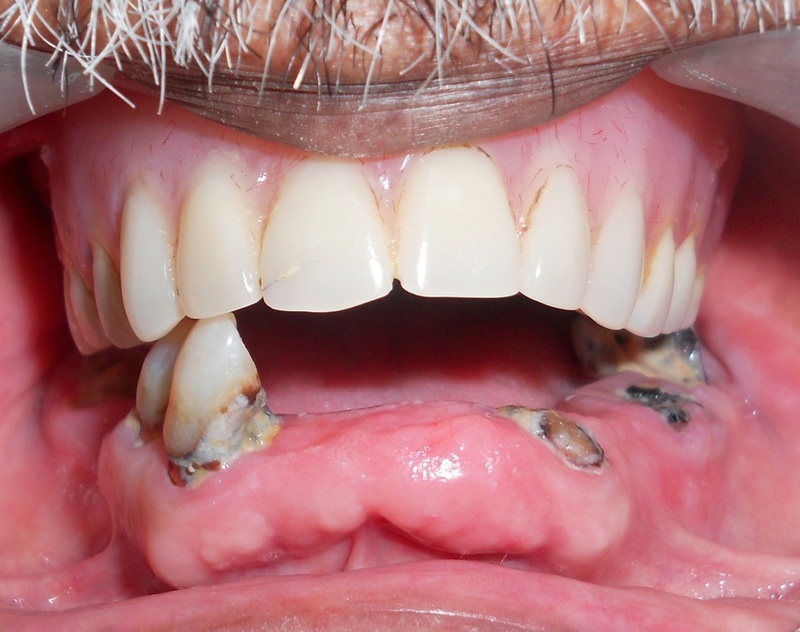 She was using a Removable Partial Denture in the lower jaw. She wanted fixed replacement in the lower jaw. All remaining teeth in the lower jaw were extracted and One Piece KOS/ BCS Implants from Idhe Dental, Switzerland/Germany, were placed. 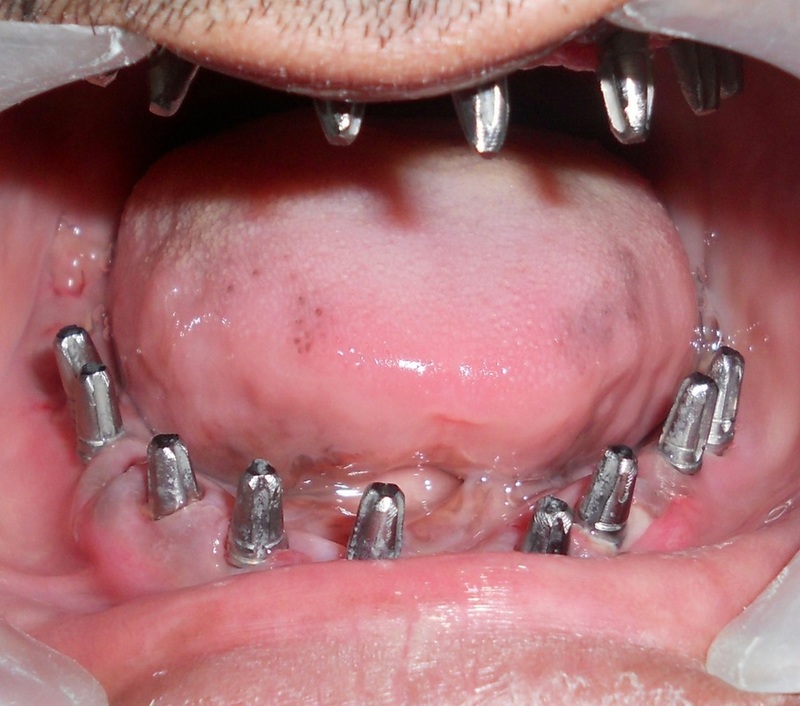 Metal Acrylic Hybrid Prostheses was cemented in the lower jaw. She is extremely happy & satisfied. 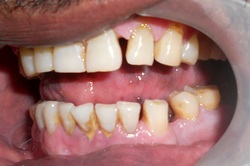 Pre Treatment Intra Oral Picture. 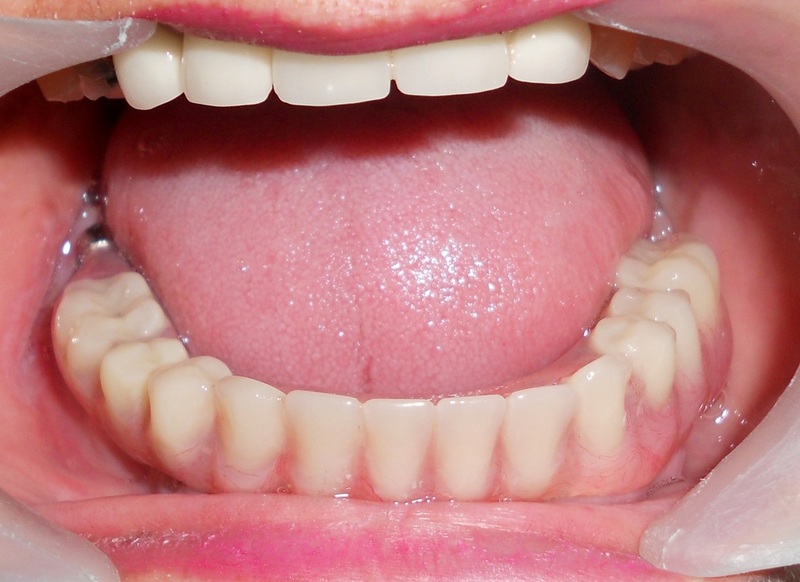 Lower front teeth are almost invisible. 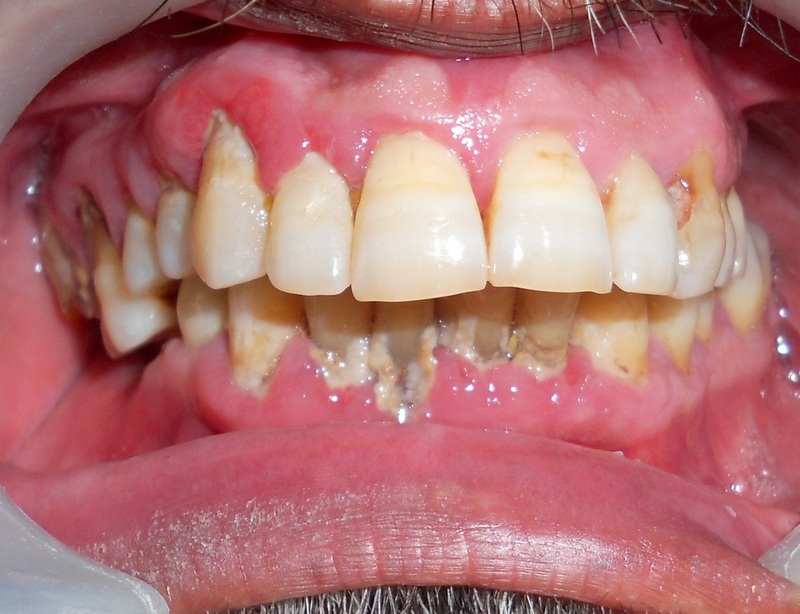 Pre Treatment Picture with lower Denture Removed. 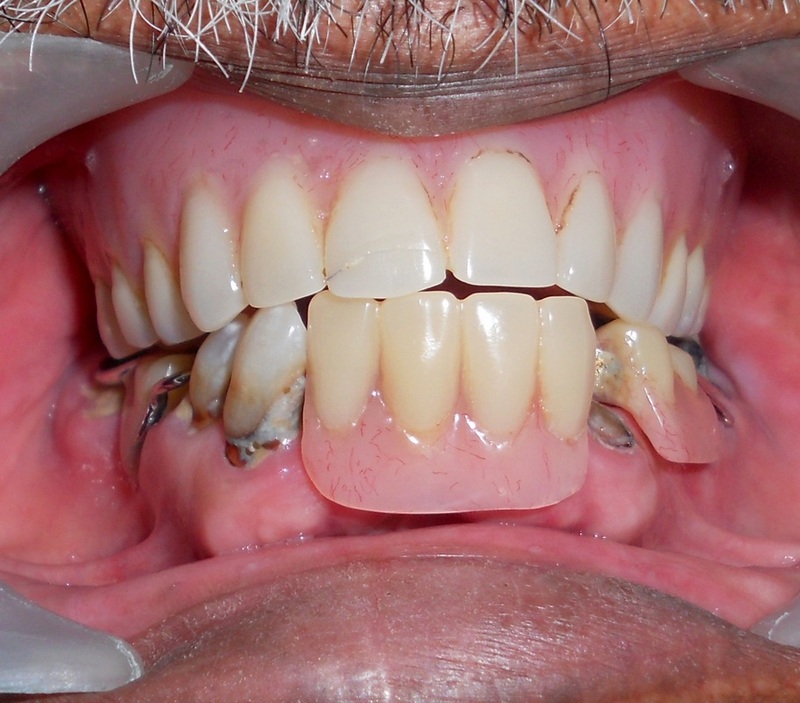 Extracted teeth & Removable Partial denture. Metal Acrylic Prostheses in place. Next Case Report:- A 65 yrs Lady from United Kingdom reported with recently extracted Upper Right Lateral Incisor & Canine teeth. 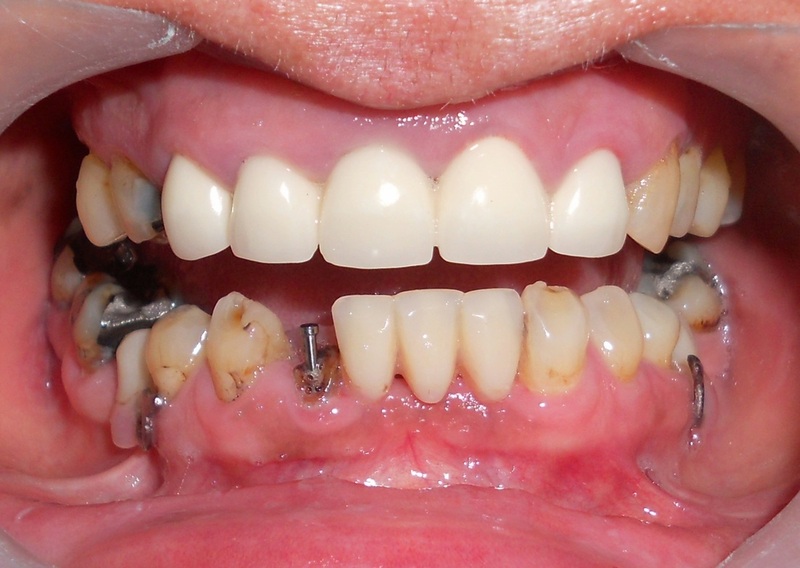 She was using a Removable Partial Denture & wanted fixed replacement. 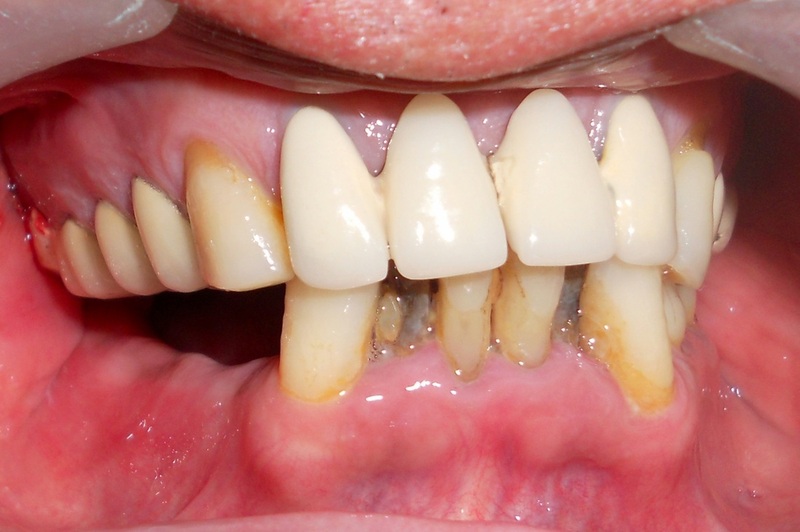 There is gingival recession over the root of 14 on mesial & buccal aspect. RVG revealed poor quality endo treatment in 14, but, with no apical pathosis. Patient did not want any treatment wrt 14. 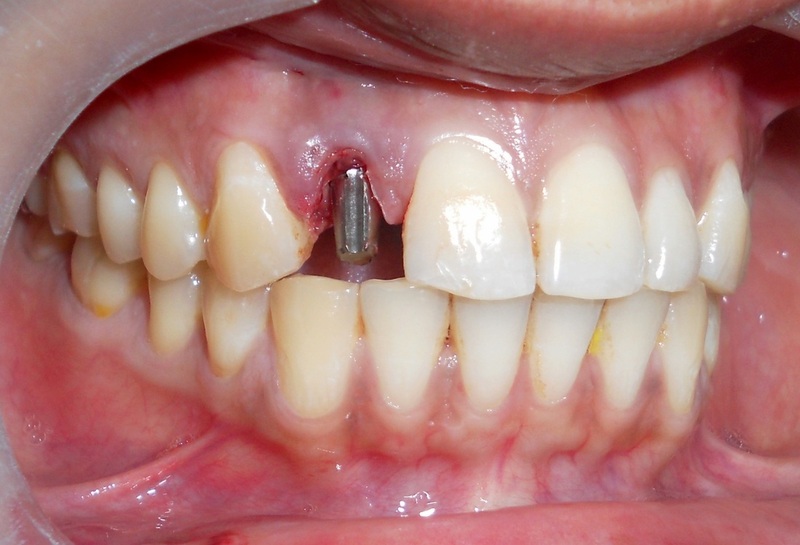 No drill was used & KOS Plus Implants( Idhe Dental, Switzerland) were placed in 12 & 13 region using hand grip. Very high stability was achieved. 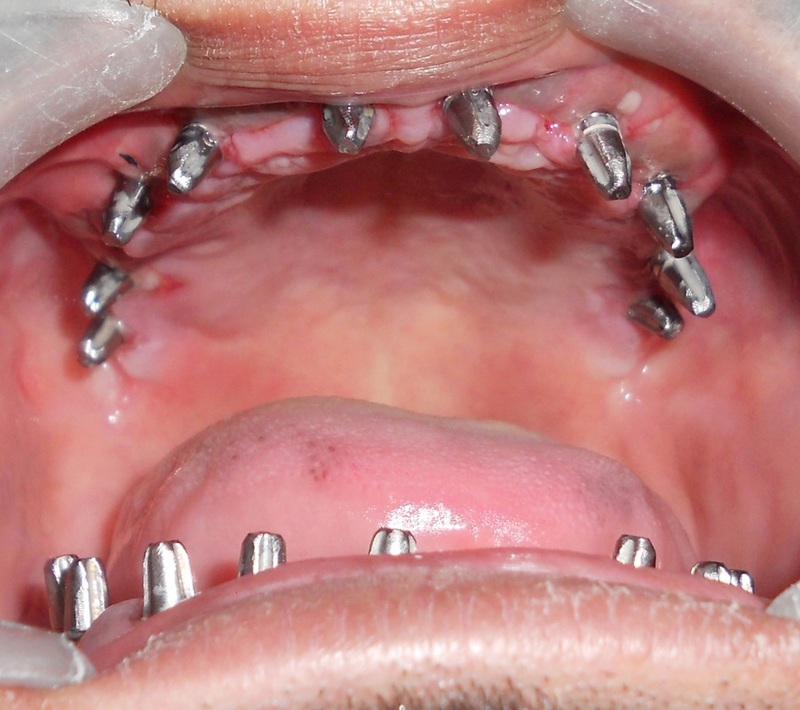 Joint metal ceramic crowns were cemented on the third day. Picture with crowns was taken on 6th day. 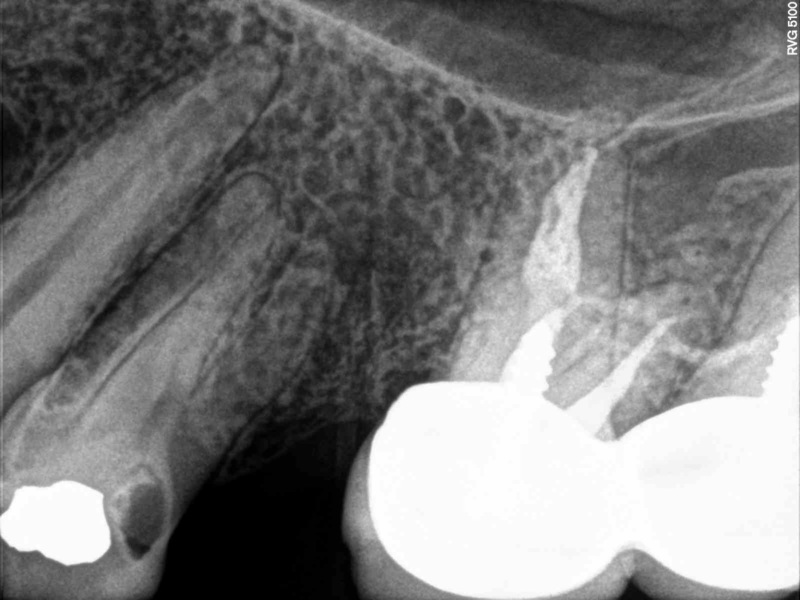 Post Cown cementation Photo on 6th day of Implant placement. 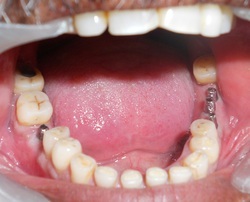 Removable Partial Denture being worn by the patient. 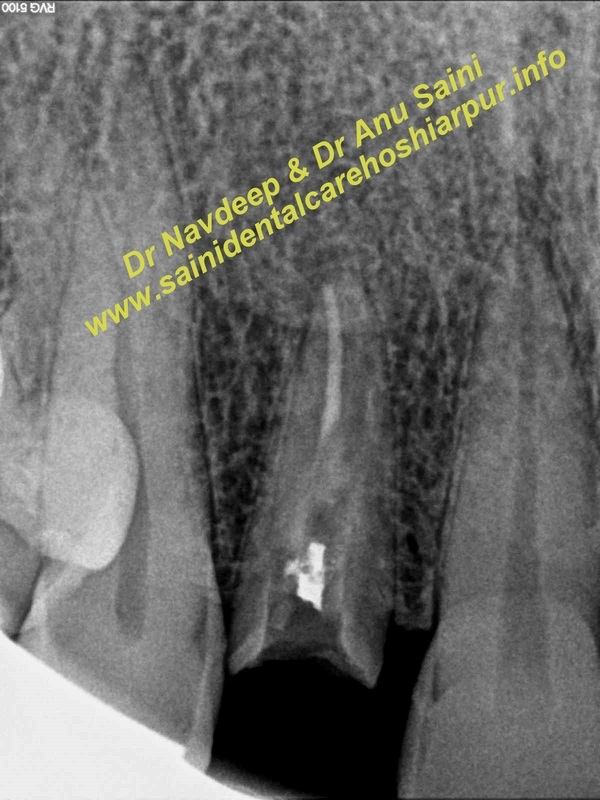 Next Case Post:- This 45 yrs old male person had an acrylic tooth fixed with cold cure resin over the root of right upper lateral incisor. 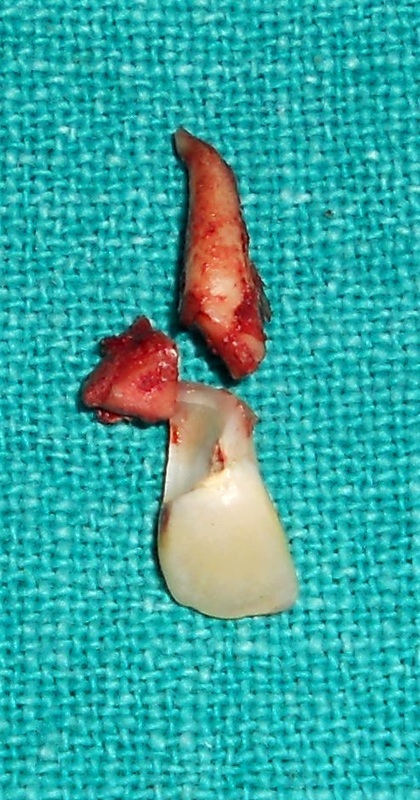 The acrylic tooth was removed, the root was extracted & an ADIN Implant 3.75x13mm with cover screw was placed. 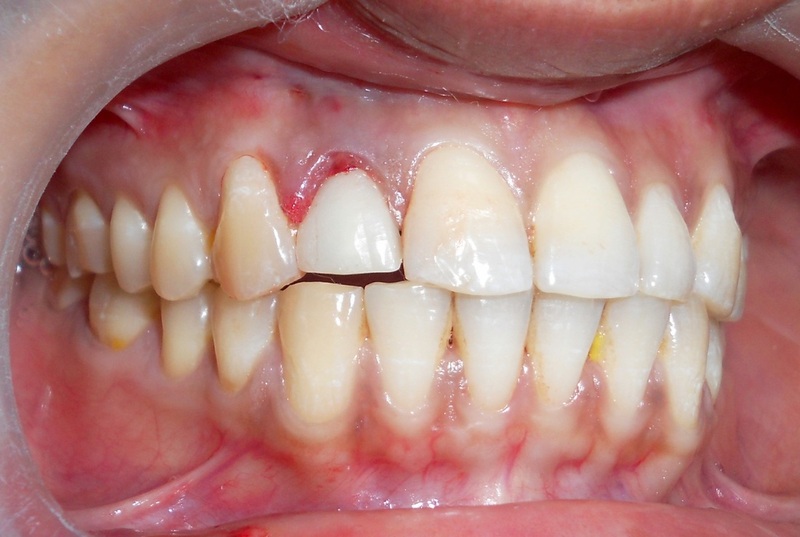 An acrylic tooth was attached to the adjacent teeth with composite resin bonding. 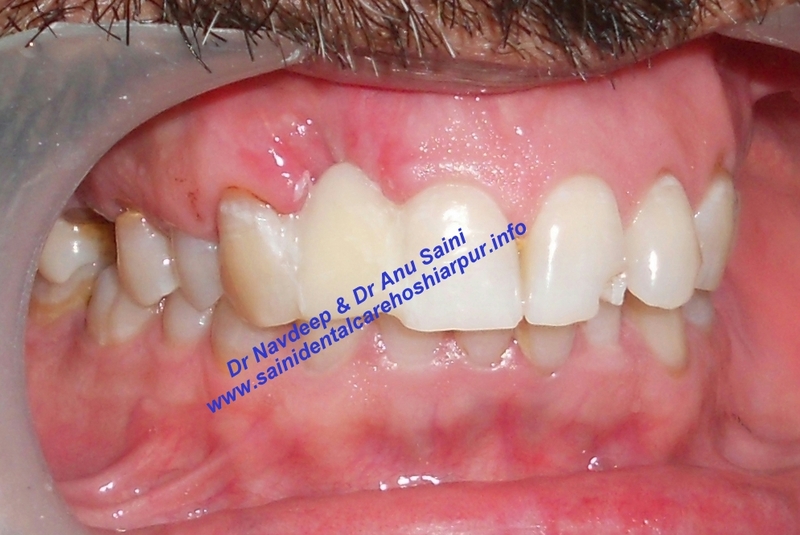 After 04 months healing abutment was attached, then an acrylic temporary crown was cemented after attaching an angulated abutment. Finally a Metal Ceramic crown was cemented. RVG with angulated abutment attached. 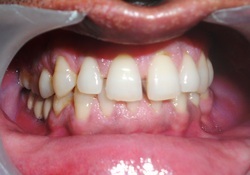 Final result with Metal ceramic crown cemented. 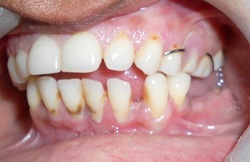 Next Case Report:- This 57yrs old female patient reported with few lower caries affected teeth & highly reduced chewing capacity over the last few years. After treating the supraerupted upper molars, the lower front teeth were removed & five KOS/BCS Implants were placed & an interim prostheses was provided which was removed after 2.5 months & three more KOS/ BCS Implants were placed. 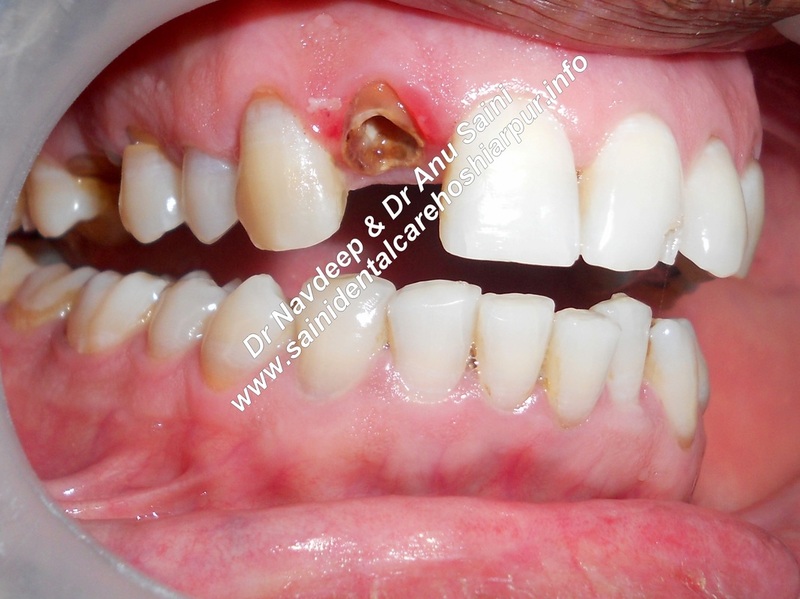 A metal ceramic bridge with occlusion from right first molar to left first molar was cemented as final prostheses. Pre Treatment Right Side view. 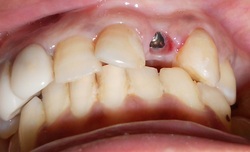 Pre Treatment Left Side view. 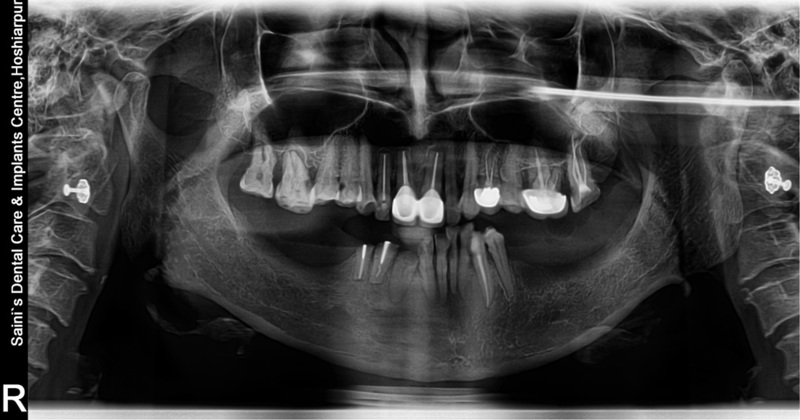 Five KOS/ BCS Implants placed after extraction of remaining lower teeth. 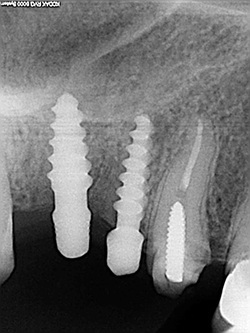 Three more KOS/ BCS Implants added taking the tally to EIGHT. Interim Hybrid Prostheses in place. 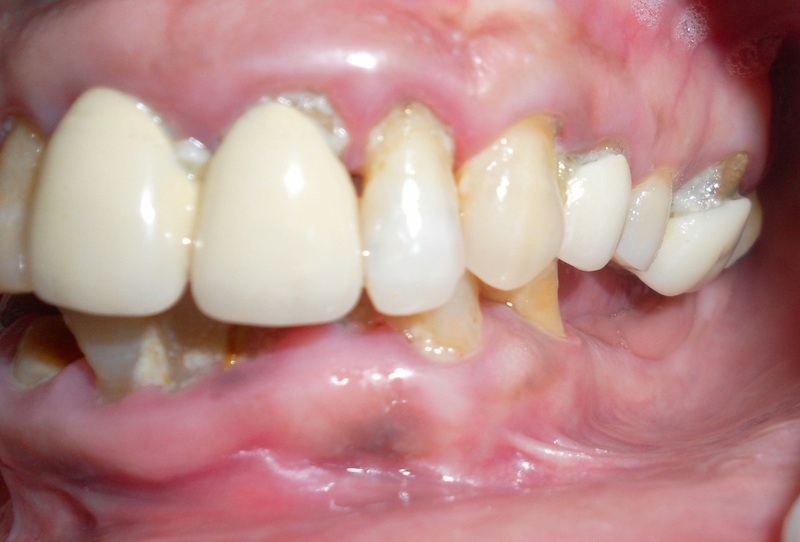 The Final Metal Ceramic Prostheses after cementation. Next Case Report:- Pictures & RVG images of a 35 year old female teacher who suffered trauma to right side of face from a stone that hit her like a projectile while she was riding a two wheeler late in the evening on 19th August, 2013. The stone was propelled by the tyre of a fast moving car that crossed near to her vehicle. 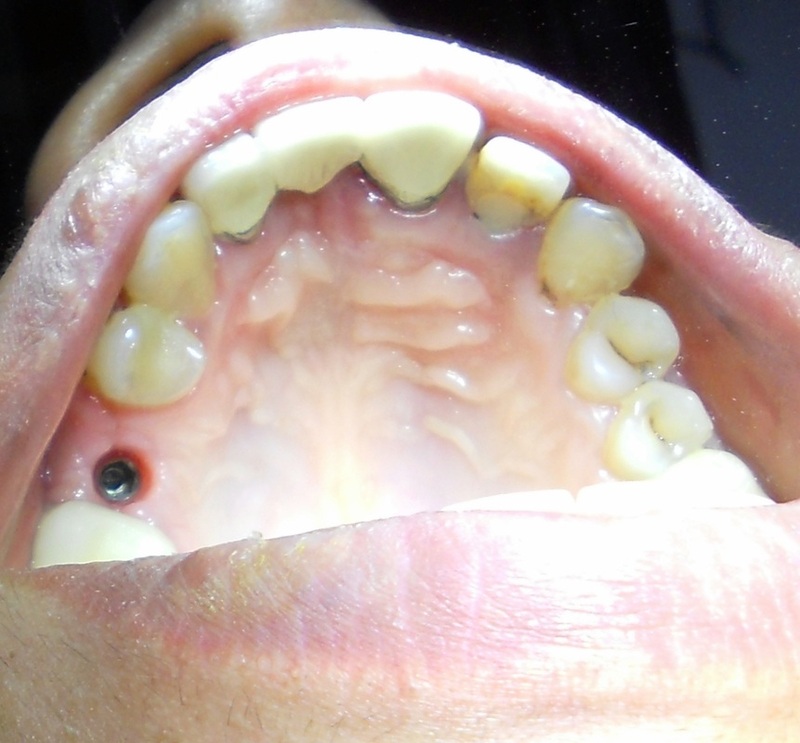 She suffered a cut on the mucosal surface of lower lip, her right upper lateral incisor got fractured in cervical third while the distal incisal edge of right upper central incisor also got fractured. 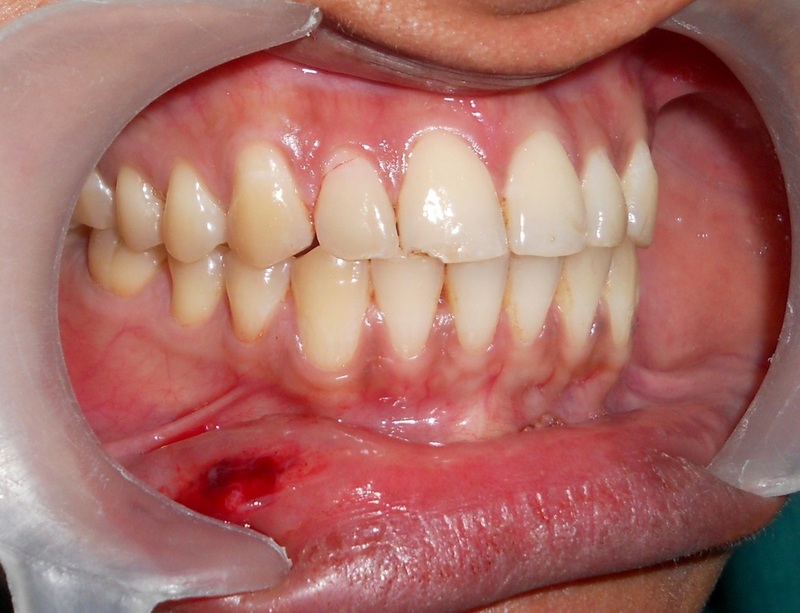 An oblique fracture of the lateral incisor was suspected from physical examination & from RVG image. She has no overjet. I rounded off the distal incisal edge of the central incisor, removed the fractured lateral incisor & placed KOC Plus 3.7 x 13+3 implant & by next morning cemented an incisally short acrylic crown with Temporary cement which will be replaced with a permanent crown with proper shade match & shape after 04 months. 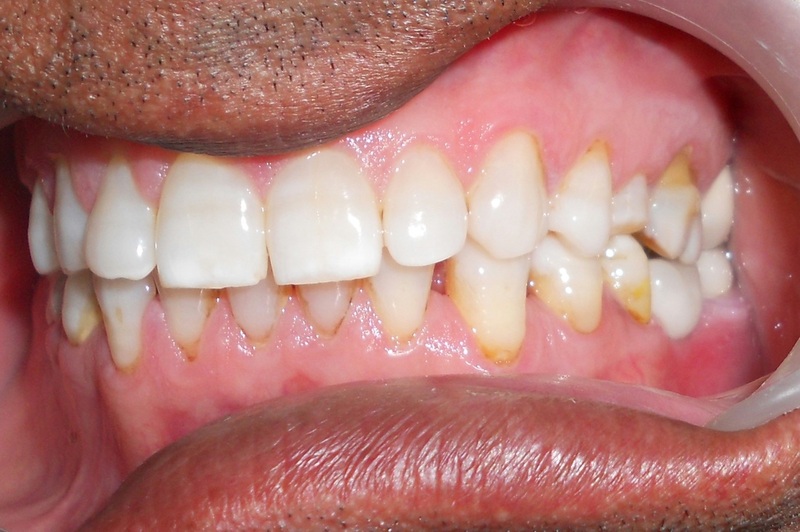 Pre treatment picture - fracture of Disto Incisal edge of right central incisor & cervical area of lateral incisor along with no overjet & injury on mucosal surface of lower lip visible. 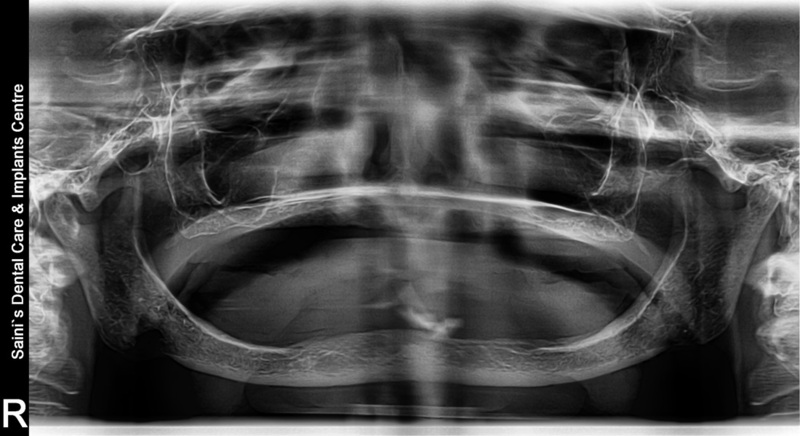 RVG Confirming oblique fracture extending from crevical area of crown subgingivally to the root. 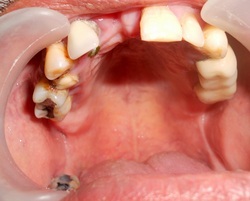 Picture immediately after tooth extraction & implant placement. 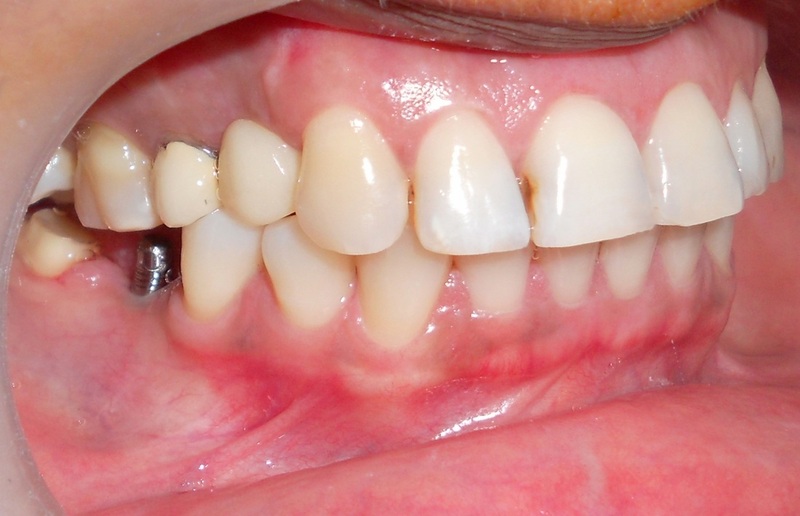 Picture on the next day morning after cementation of temporary crown. 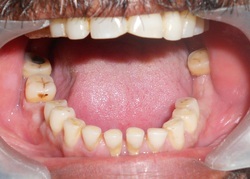 Next Case Report: This 57 yrs old male patient from New Zealand had mobile lower front teeth. Scaling was done. 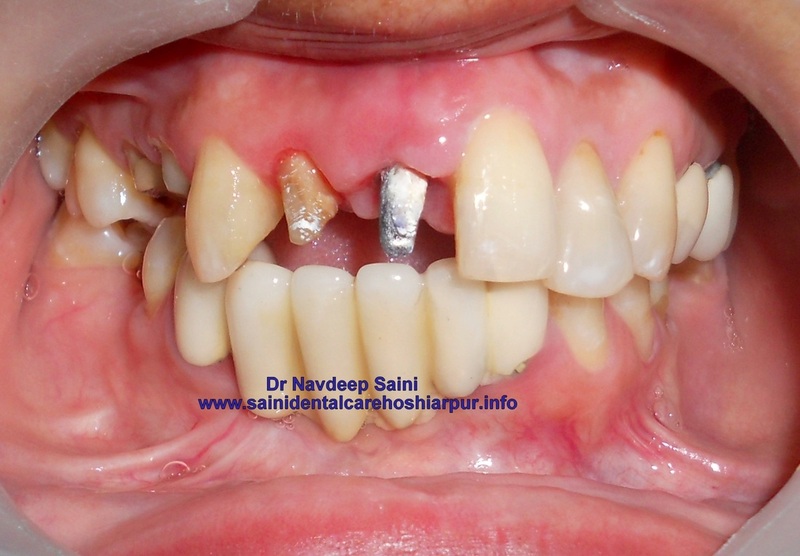 The four incisors were extracted & three BCS Implants were placed. 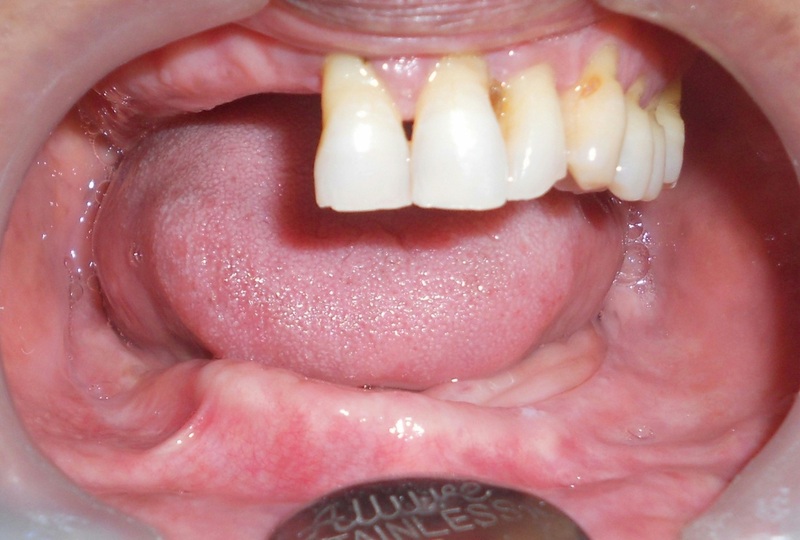 A Metal Ceramic Bridge was cemented on third day of Implant Placement. 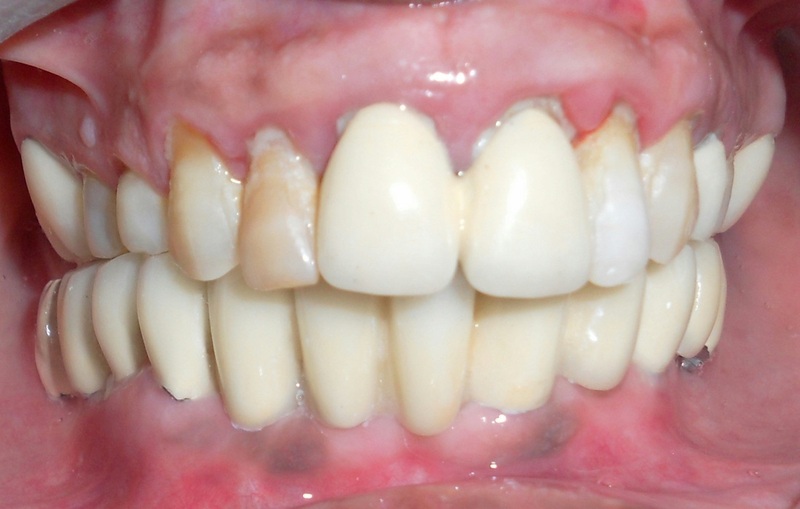 Pre Treatment Picture - Extensive calculus deposits & gum Inflammation are evident. 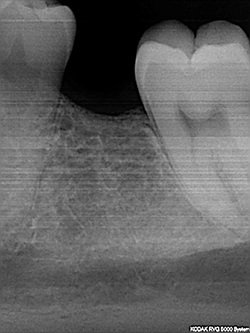 Pre Treatment RVG revealing extensive bone loss around the incisor roots. 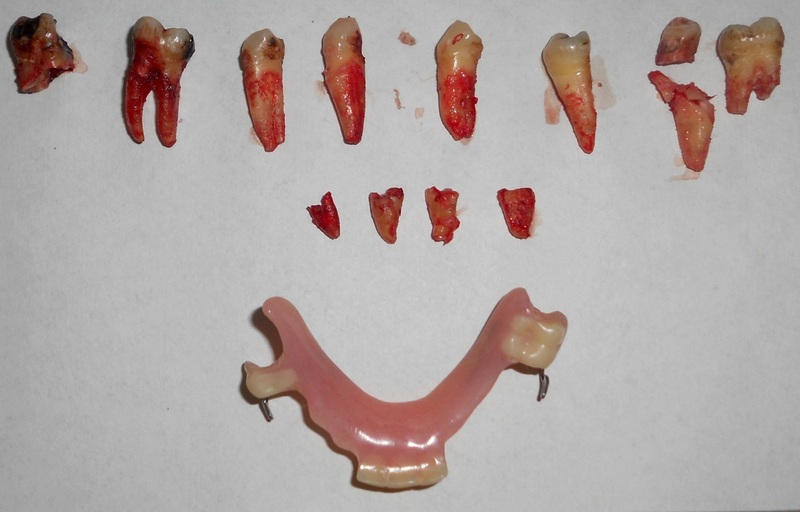 Picture of the extracted lower incisor teeth. 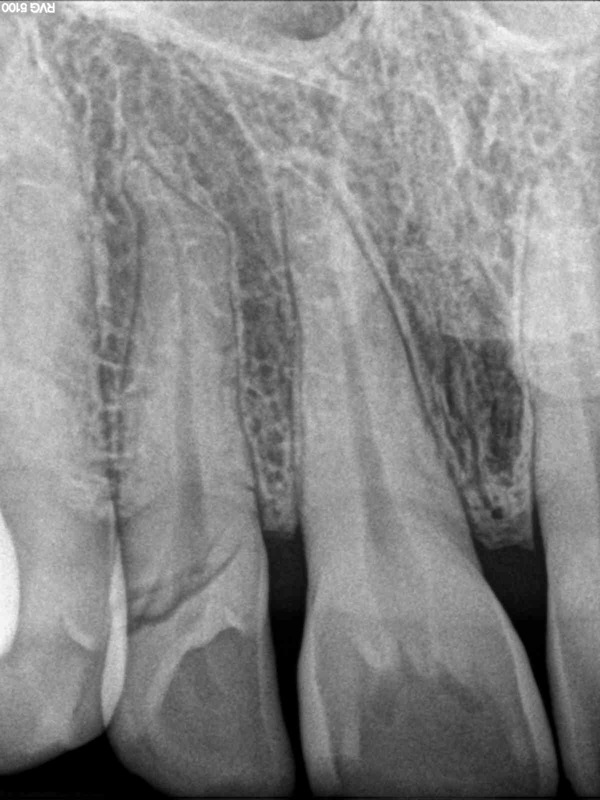 Next Case Report: The following pictures/ X Rays relate to A female patient who reported with loose joint upper front Metal Ceramic Crowns. 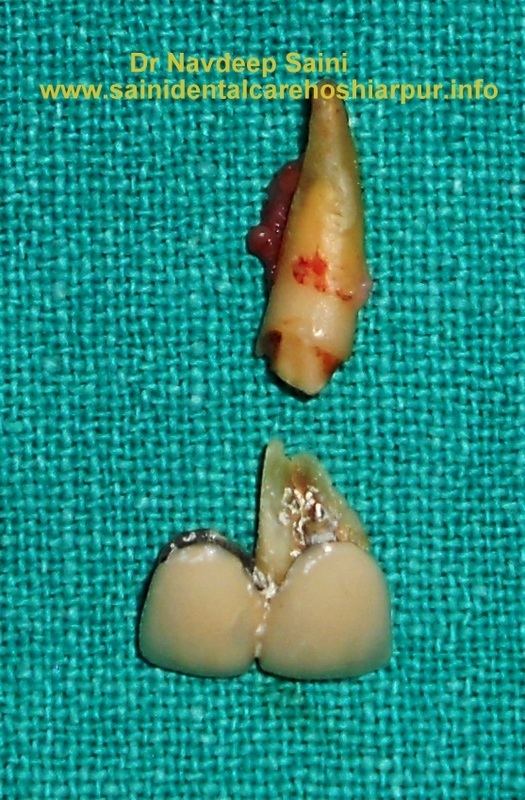 Both teeth were previously root canal treated. 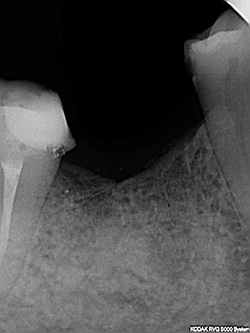 An oblique fracture of right central incisor extending subgingivally to the root was observed. 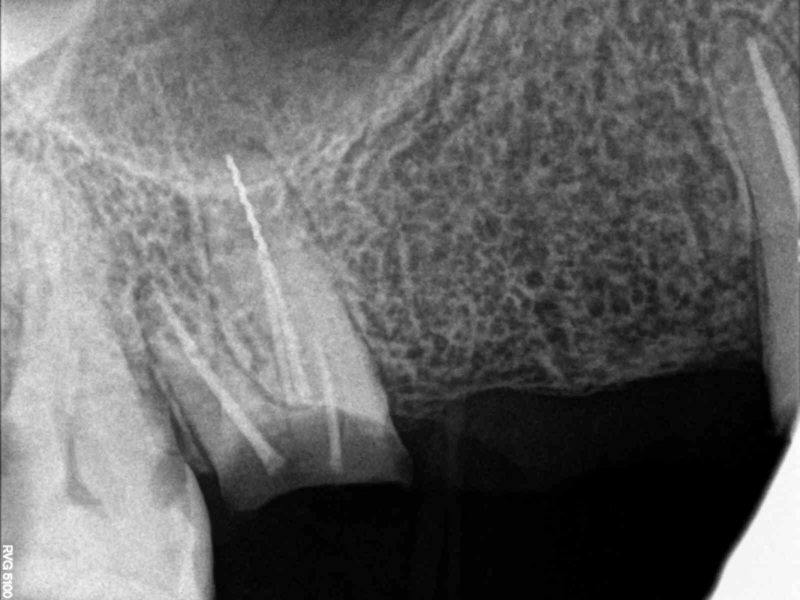 The central incisor root was extracted & an ADIN 3.75x13mm Implant & cover screw were placed. Right lateral incisor crown was repaired. 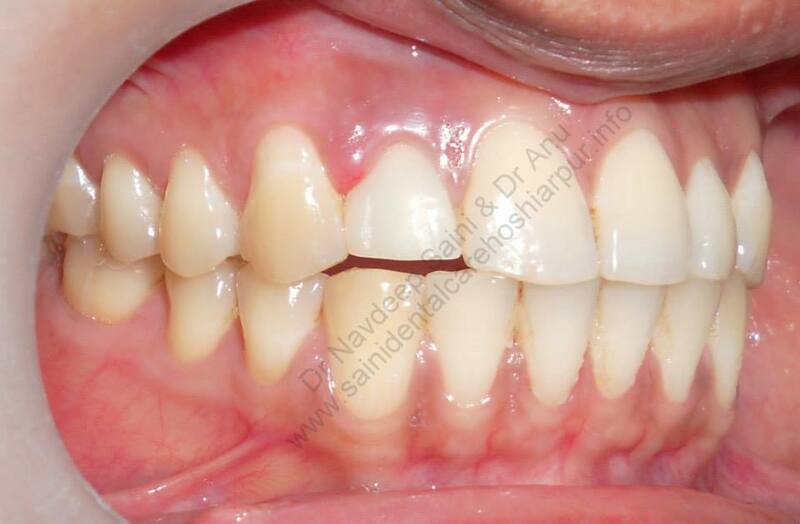 Joint cantilever acrylic provisional crowns were cemented & splinted with left central incisor with composite bonding. 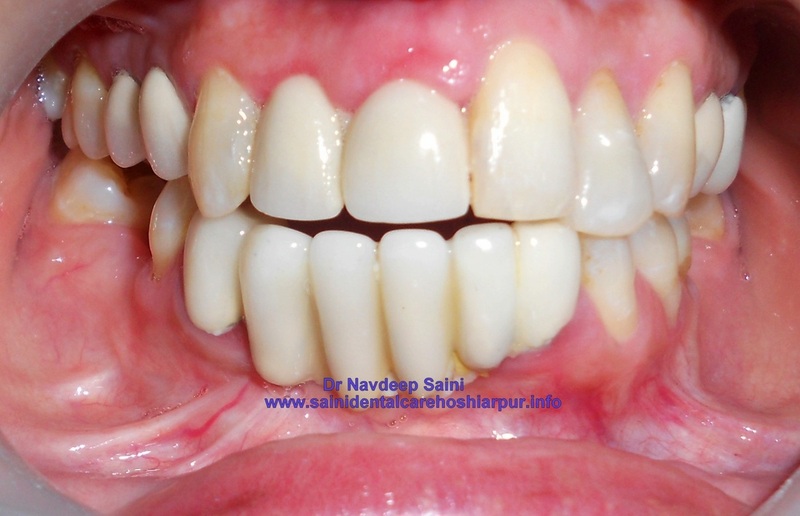 After four months adjacent teeth were repaired with Light Cured Composite resin material. 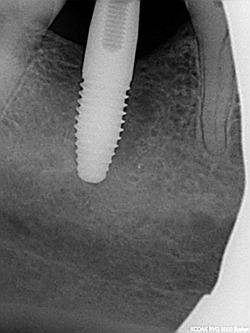 Abutment was attached to the implant. 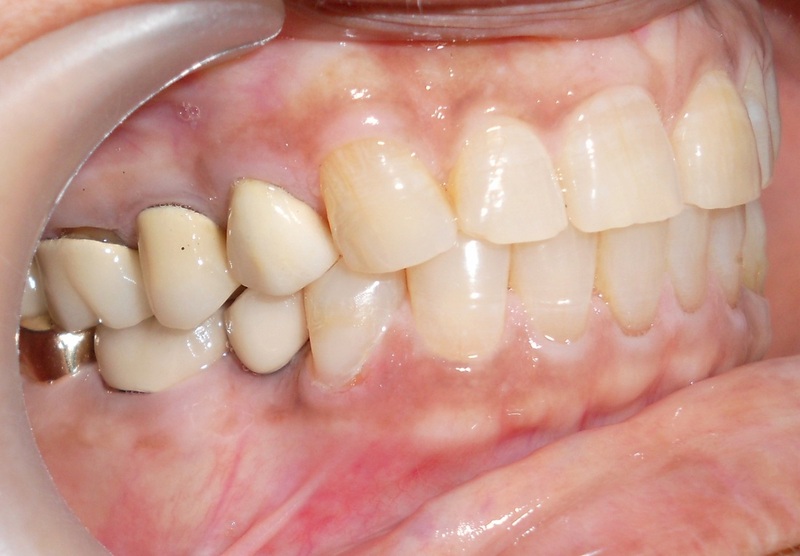 Individual Metal Ceramic crowns were cemented on the Central & Lateral Incisors. 1. 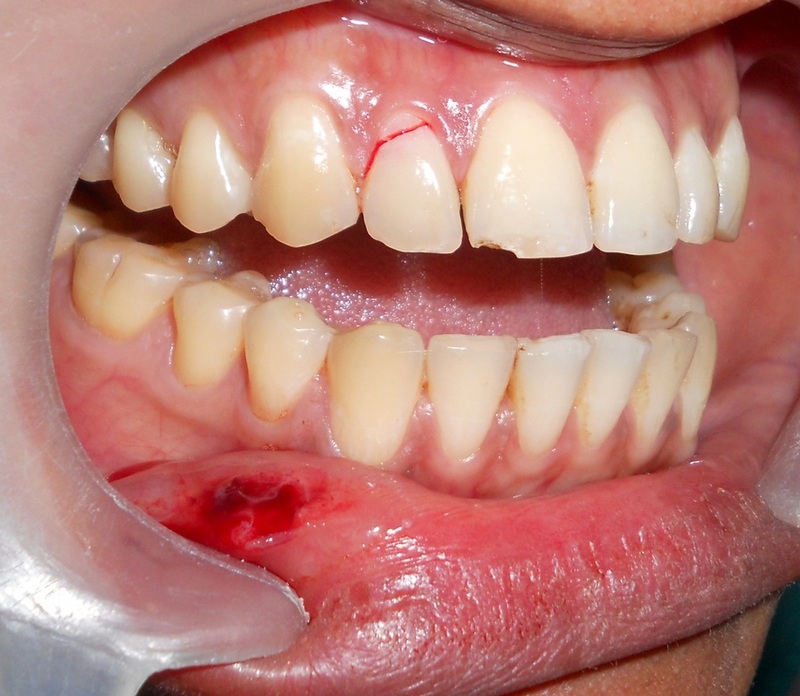 Pre Treatment picture - Fractured Right Central Incisor. 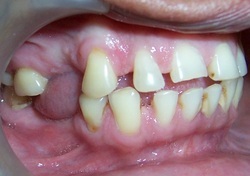 Caries in Right Lateral Incisor, Canine & Left Central Incisor. 2. 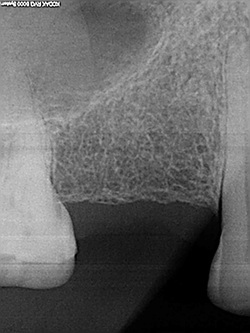 Pre Treatment X Ray shows root canal treated Right Central & Lateral Incisor teeth. 5. 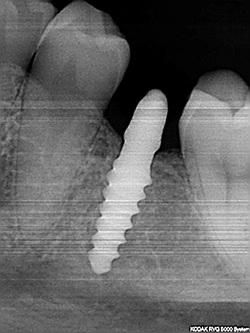 ADIN 3.75x13mm Implant placed after removal of root of Right Central Incisor. 9. Provisional crowns in place. 3. Fractured right Central Incisor. 6. 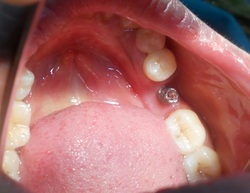 Picture Immediately after Implant placement. 8. 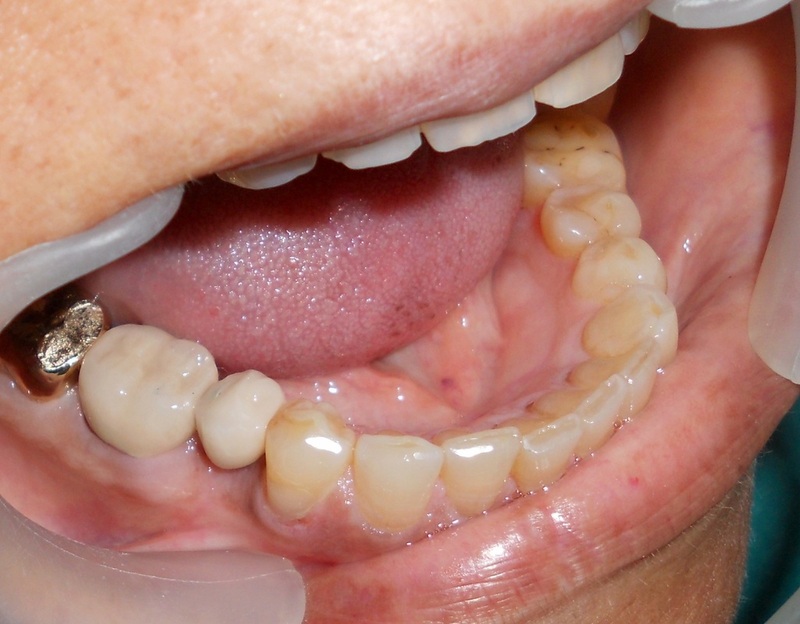 Abutment attached to the Implant before final crown cementation. 4. 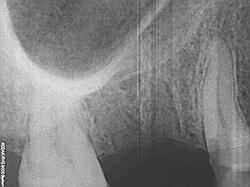 Oblique Fracture of the Central Incisor Root. 7. Provisinal Crowns cemented by the evening. 10. 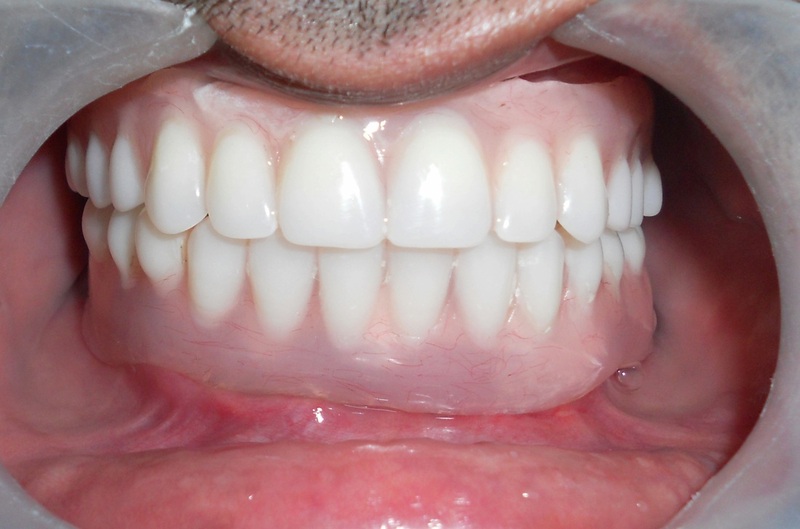 Final Result- Individual Metal Ceramic Crowns Cemented. 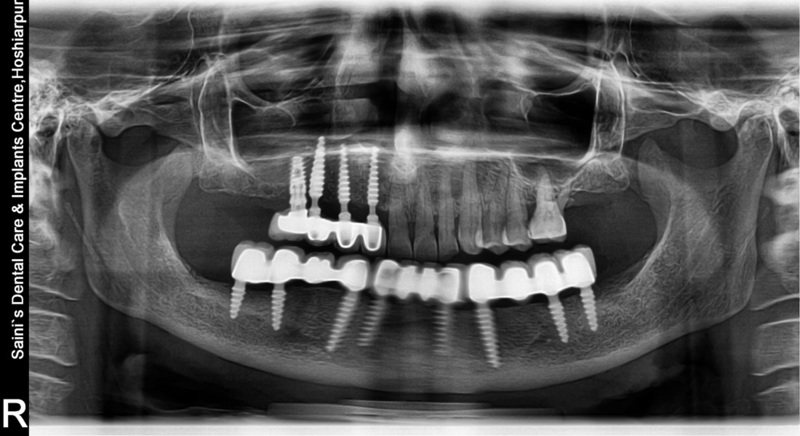 10 BCS Implants placed in the Upper Jaw after extracting periodontally compromised teeth. 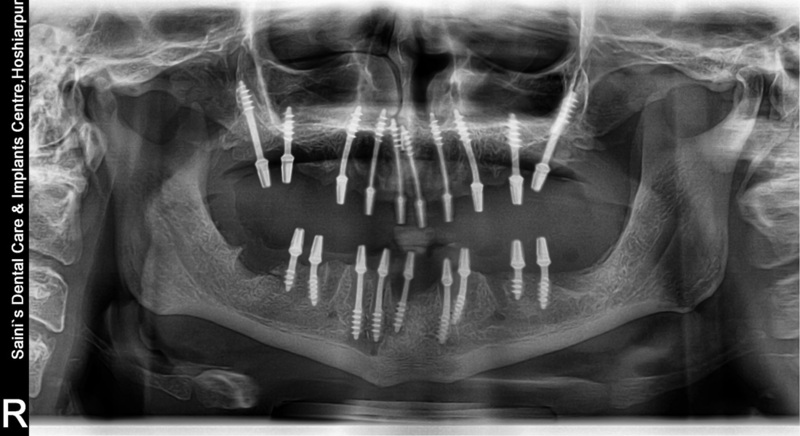 9 BCS Implants placed in the lower jaw after removing periodontally compromised teeth. Final outcome - a hybrid prostheses has been cemented. Pre Treatment OPG X Ray. 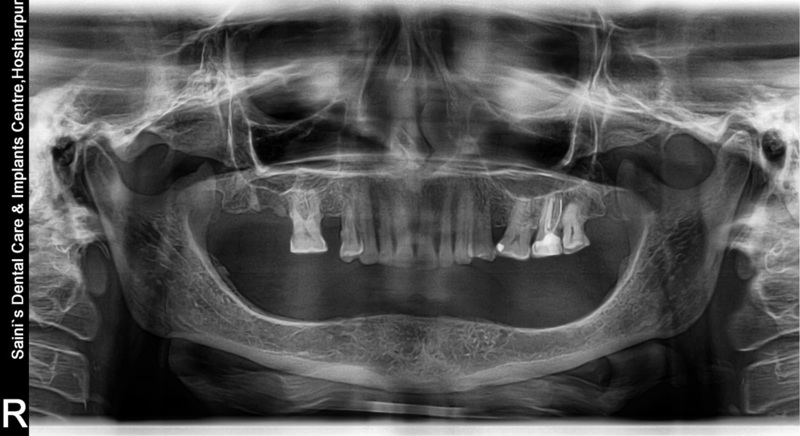 OPG X Ray dated 24-8-2012. 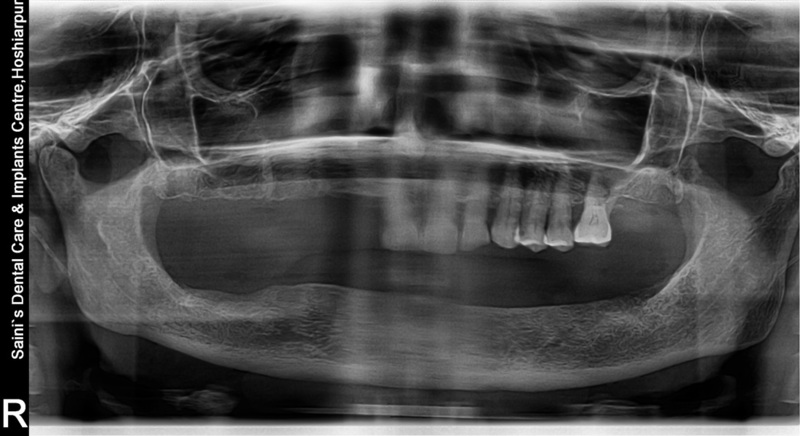 OPG X Ray dated 5-9-2013. Post Treatment Photo - NSS. Abutment added after a few months . This person -a very busy Doctor, lost left upper lateral incisor tooth crown & had cavities in left Central Incisor & Canine Teeth . 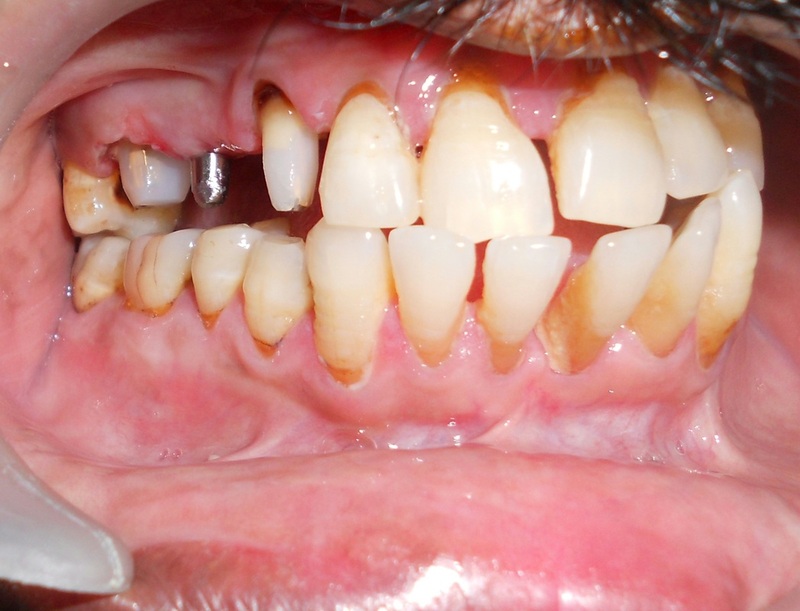 The cavities in the Central Incisor & Canine teeth were cleaned & filled with light cured composite resin material . 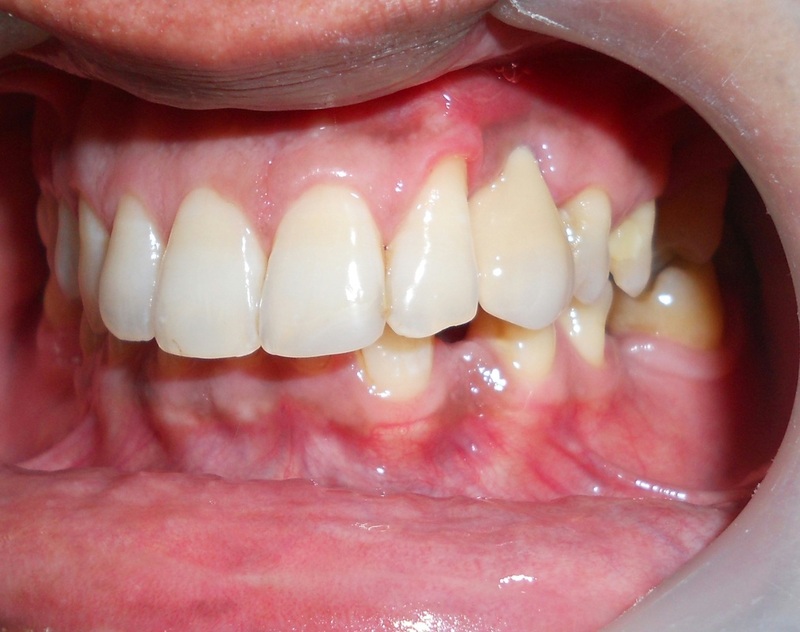 The root of the Lateral Incisor was removed & a Nobel Biocare 3.5x16mm Select Tapered Implant was placed in the socket , abutment was attached & an immediate Temporary Crown provided which was later on replaced with a Permanent Metal Ceramic crown . 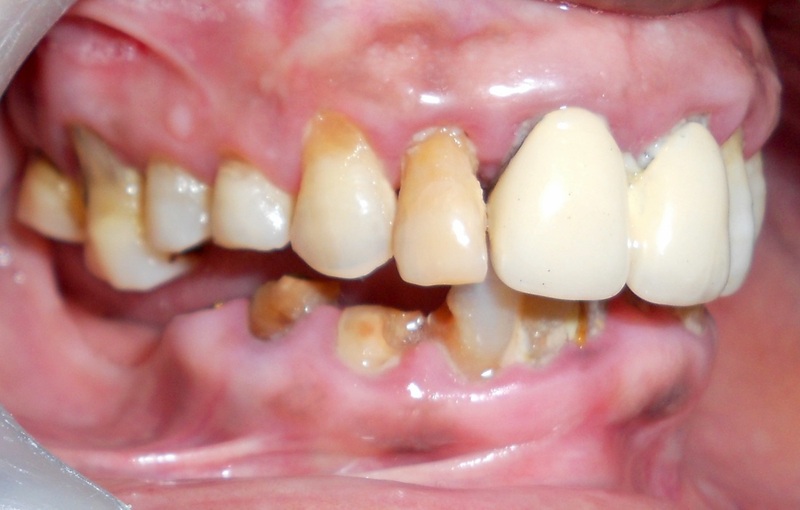 Fillings Done in Central Incisor & Canine, Implant & Abutment Placed in fractured lateral incisor region . 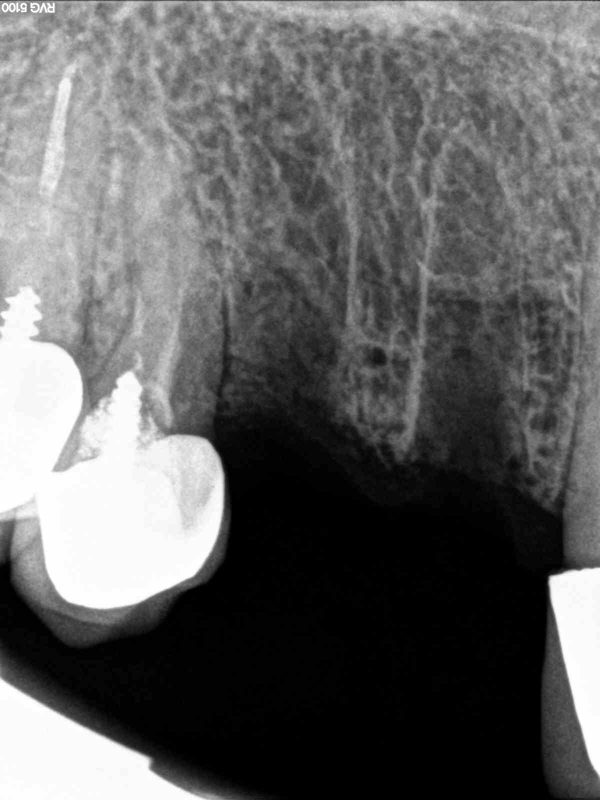 Nobel Biocare 3.5x16 Implant & abutment placed after removing Lateral Incisor Root. This person was provided with a Maryland Bridge, in Japan about 15 years back, as he lost lower two central incisor teeth in a road accident. 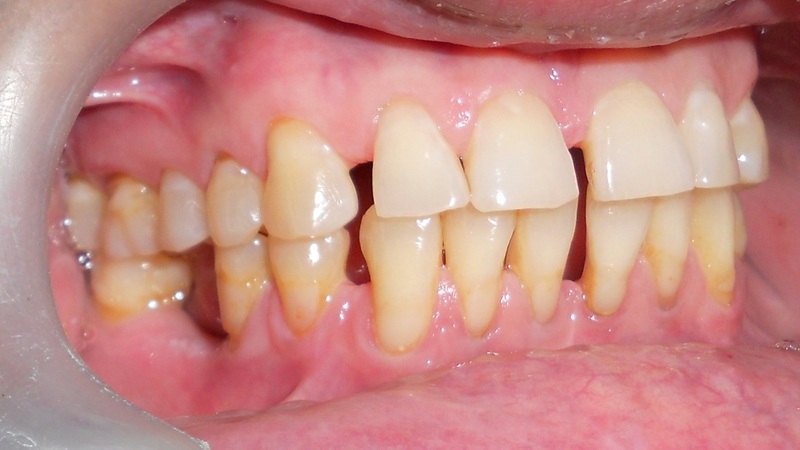 Over the time, the root canal treated lateral incisors & canines became discolored , the right lateral incisor became separated from the bridge due to its lipward displacement. 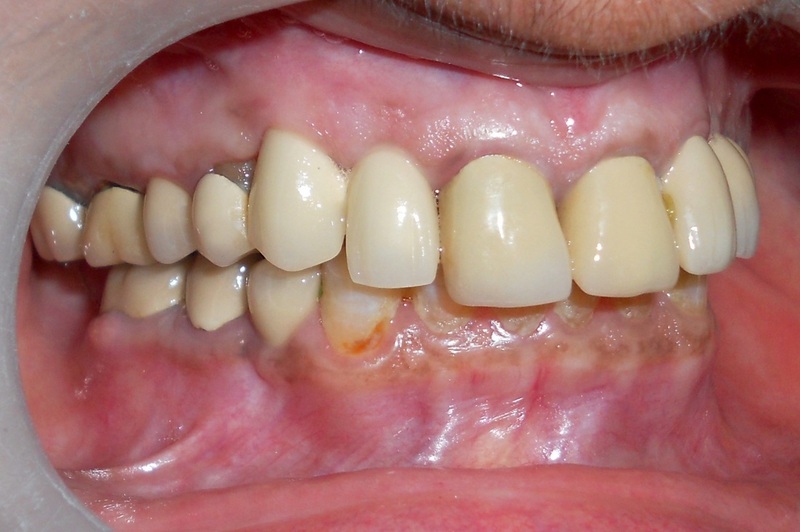 The Maryland bridge was cut away, the lateral incisors & canines were prepared for Metal free full coverage crowns. 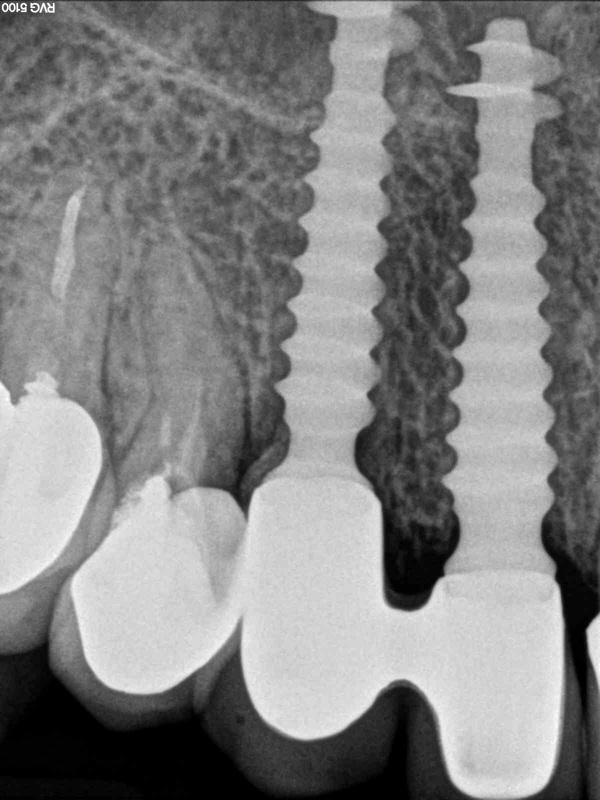 Two KOS 3.0x10mm implants were placed in missing Central Incisors region. 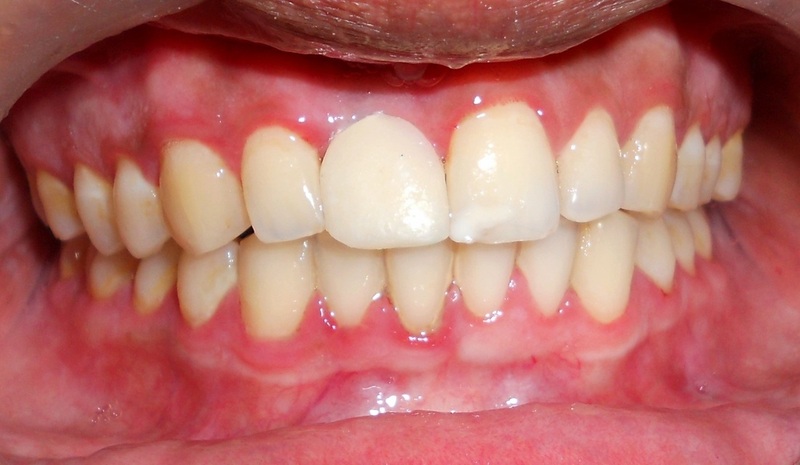 The patient was provided an acrylic temporary bridge on the day of treatment. 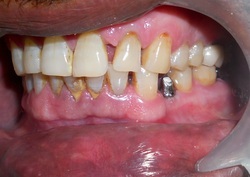 Individual Metal Free Crowns were cemented a few days later. 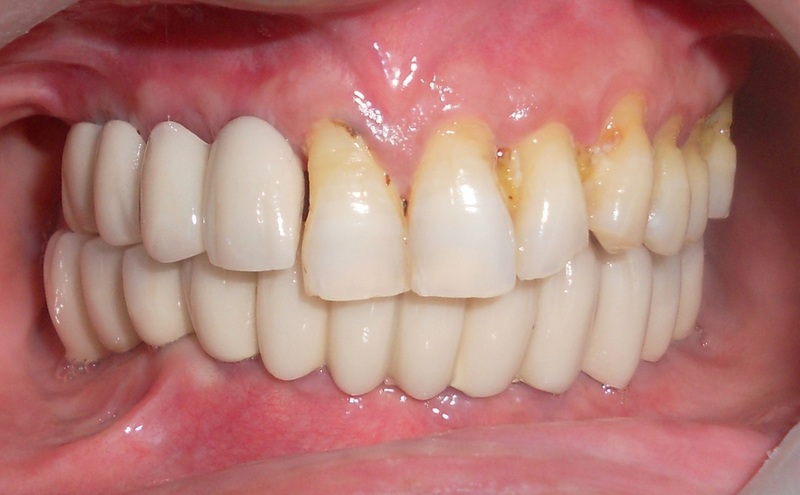 Crown Preparation done on Lateral Incisors & Canines for Metal Free Crowns . 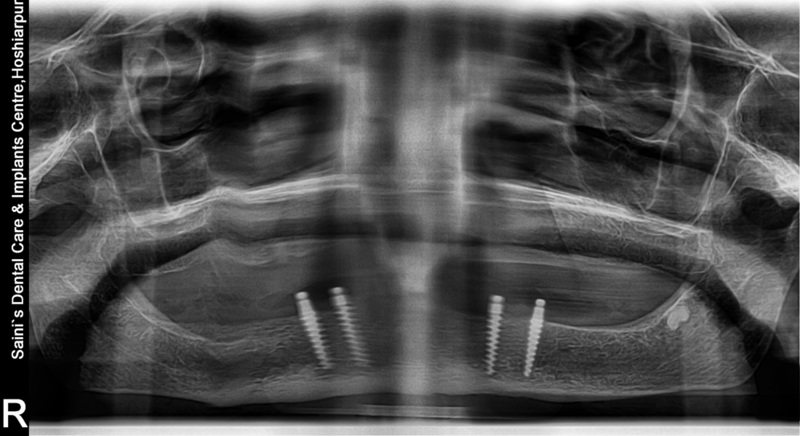 Two KOS 3.0x10mm One Piece Implants placed in missing 31 & 41 regions. 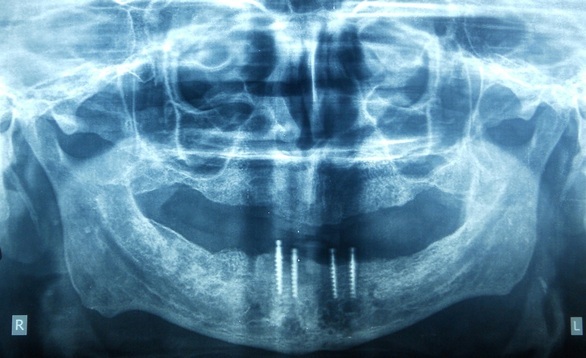 3.0x10mm KOS Implants in 31,41 regions . 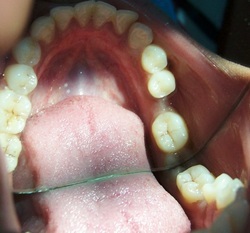 Temporary Acrylic Bridge provided on the same day for patient convenience . Cemented with Panavia F - dual cure cement . Missing 14,15. 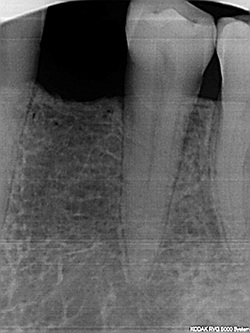 16 Previously Root Canal Treated, but the coronal part has decayed SSB . Gold Screw Posts & Light Cured Composite Build up on 13 & 16- SSB. 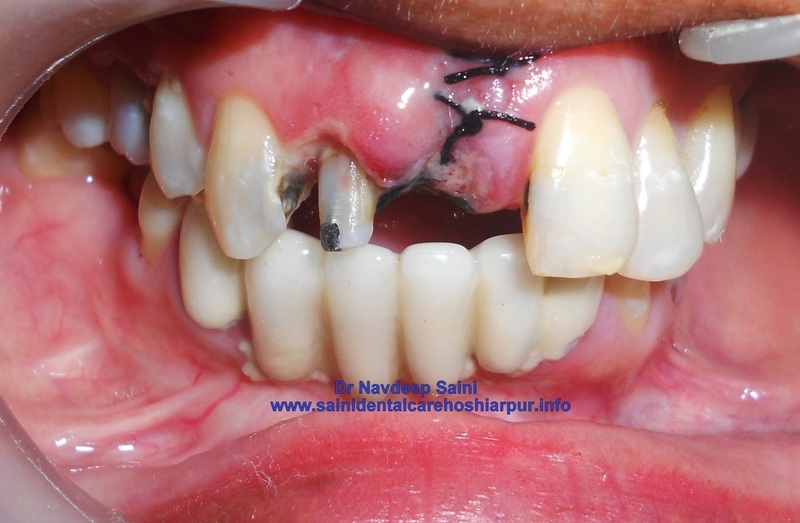 Missing 11, Patient was wearing a removable partial denture( RPD) for last ten years - TSP. Pre Treatment IOPA X Ray- TSP. 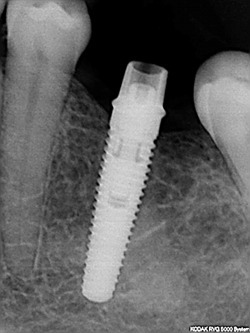 KOS E implant inserted- TSP. Three Gold Plated Screw posts Fitted in 16, Core Build up done . 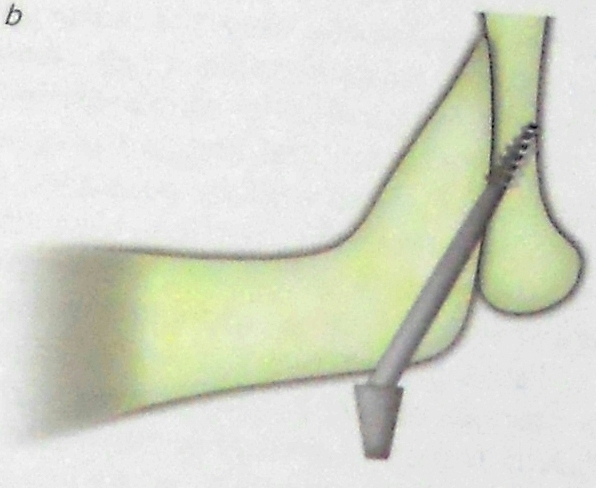 KOS Bendable Implant inserted in 15 region - SSB. KOS Bendable Implant Placed in 15 Region - SSB. Post Treatment OPG - SSB. 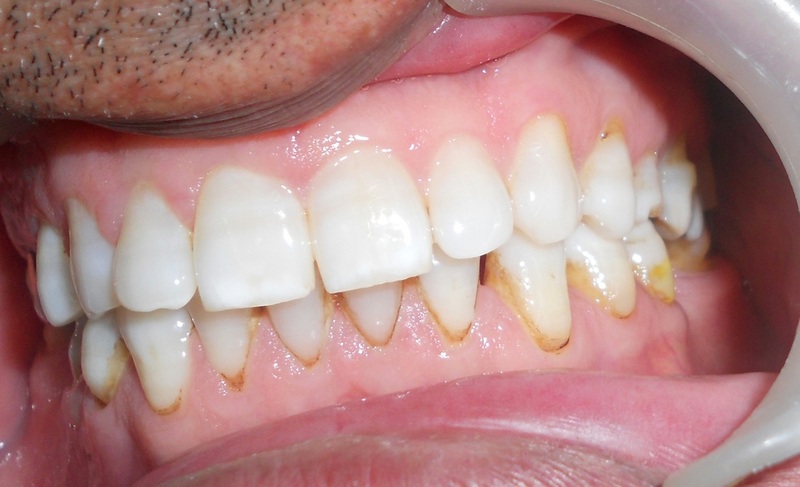 Immediate Acrylic Temporary Crown cemented - TSP. 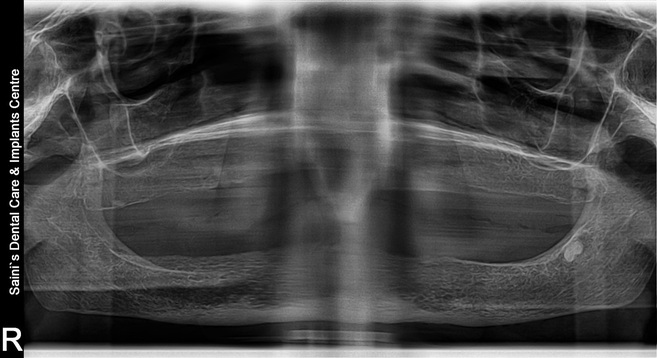 Post Implant insertion X Ray- TSP . 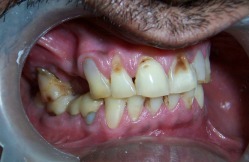 Pre Treatment Photo- Missing Left Upper Canine -RK. Metal Ceramic Crown Cemented -23-RK . 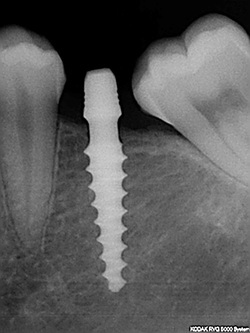 Uniti Equinox Implant placed in 23 region - RK . 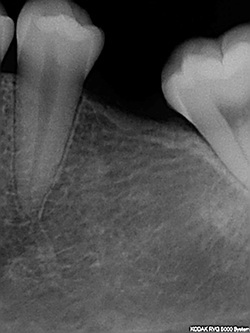 Missing Right Lower Second Premolar -45- SKC. 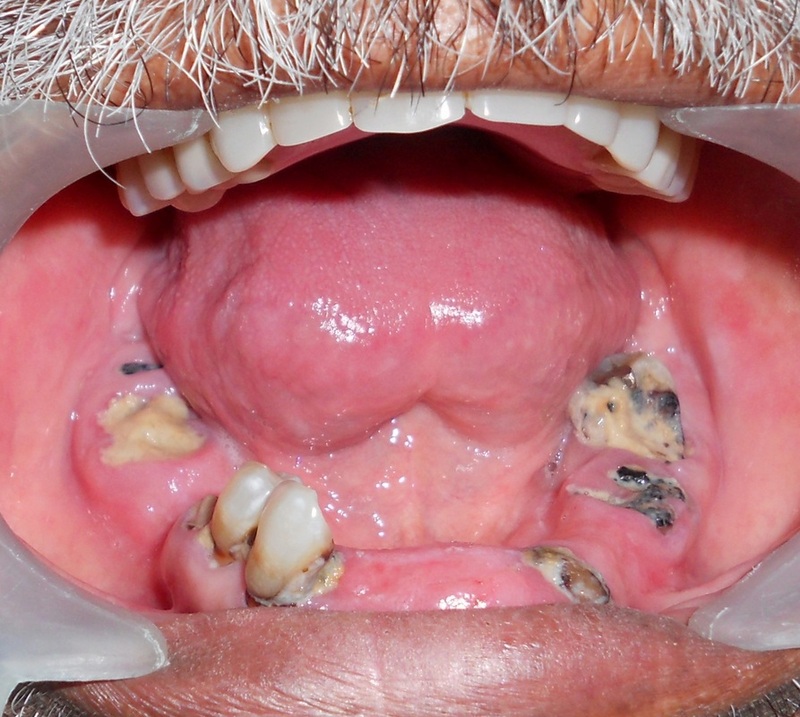 Pre Treatment Intraoral Picture - 45- SKC . 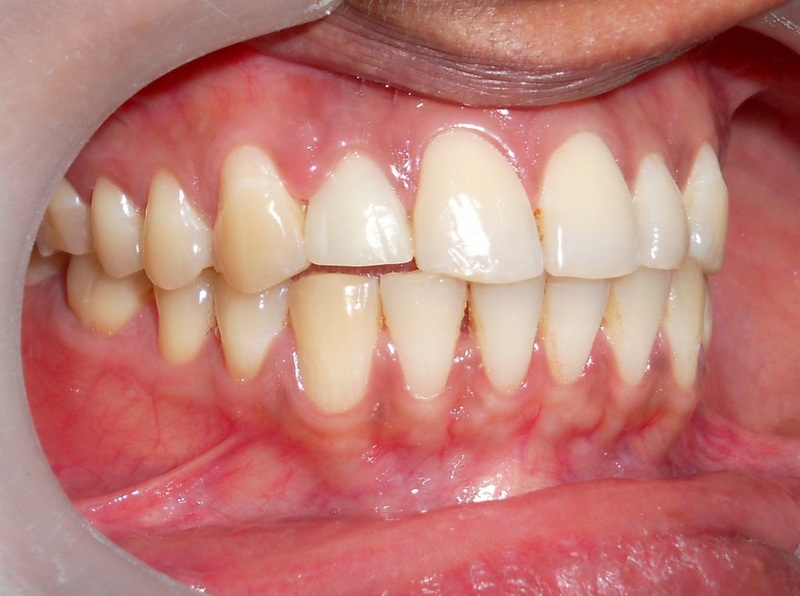 Post Metal Ceramic Crown Cementation Photograph -SKC . 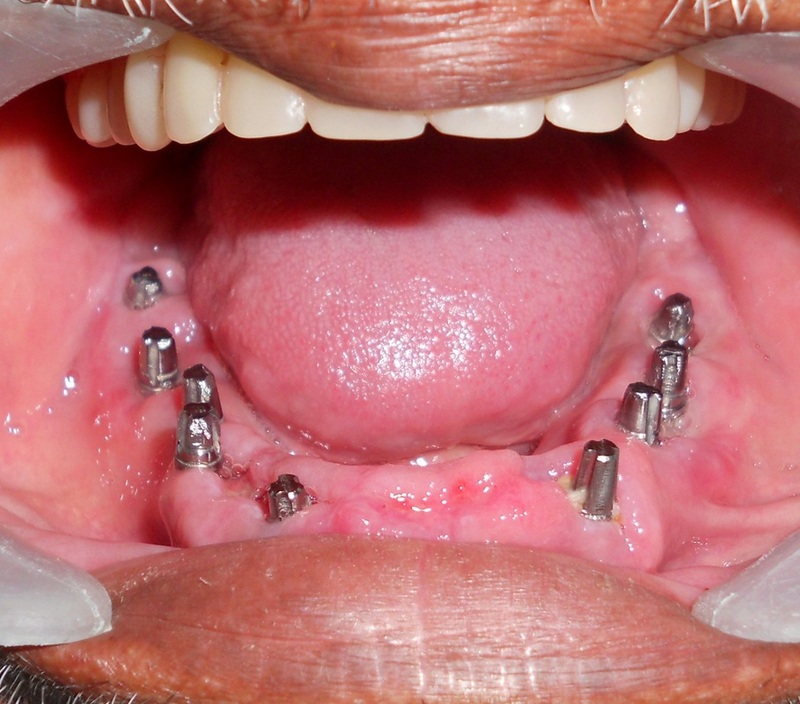 Abutment Attached to Uniti Implant - RK . Pre Treatment X Ray- Missing 23 - RK . 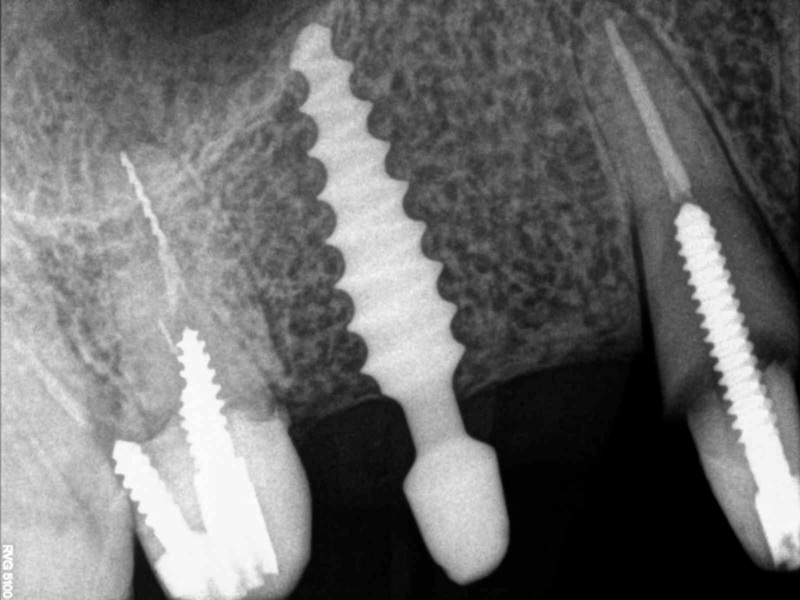 Abutment attached to Implant -RK . 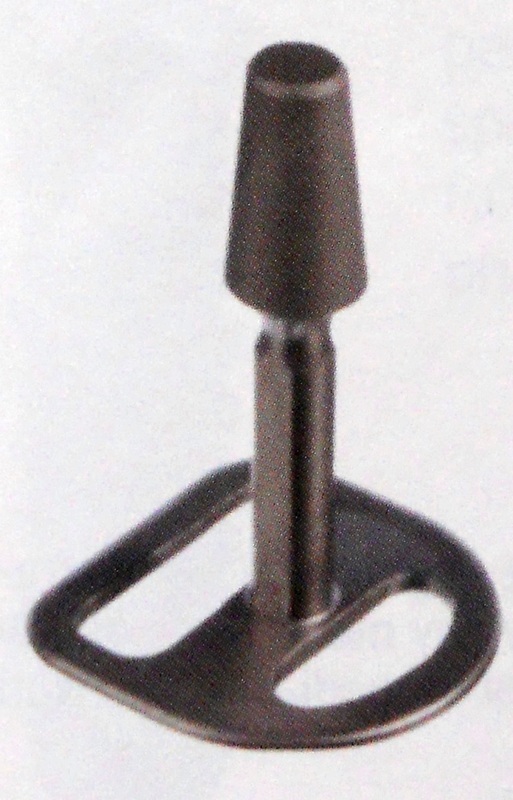 KOS Single Piece 3.7x15mm Implant placed -SKC . 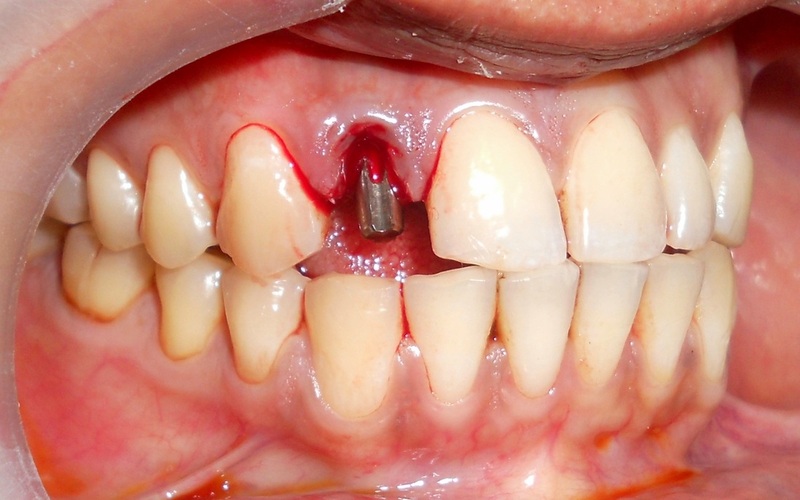 Post Implant Insertion Photograph - 45- SKC . 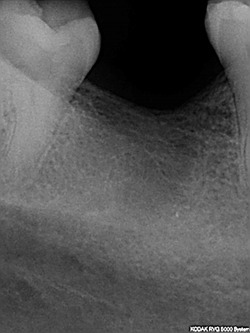 Post Metal Ceramic Crown Cementation Photograph - SKC . 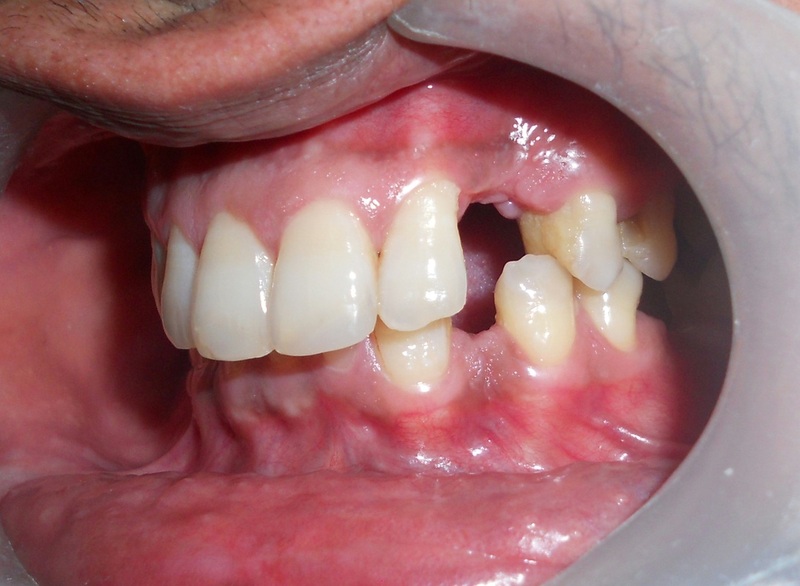 Patient lost an Upper front tooth & lower front teeth except mobile left lateral incisor , in a car accident -BS . 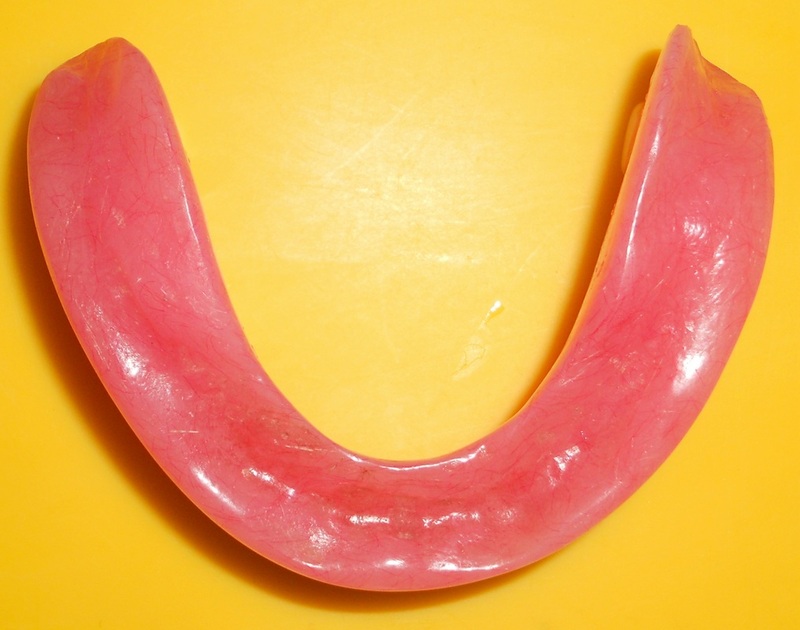 Upper Removable Partial Denture Provided . Lower Left Mobile Lateral Incisor extracted . 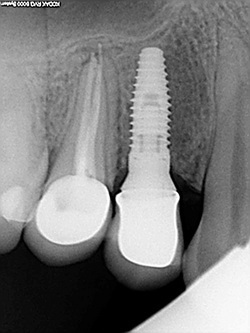 Two BCS 3.5x14mm Implants placed in 32 & 42 regions -BS. Pre Treatment Intra Oral X Ray- BS. 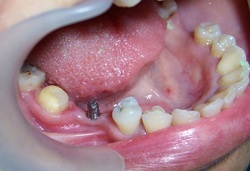 Post Implant Placement Intra Oral X Ray -BS. Pre Treatment X Ray . 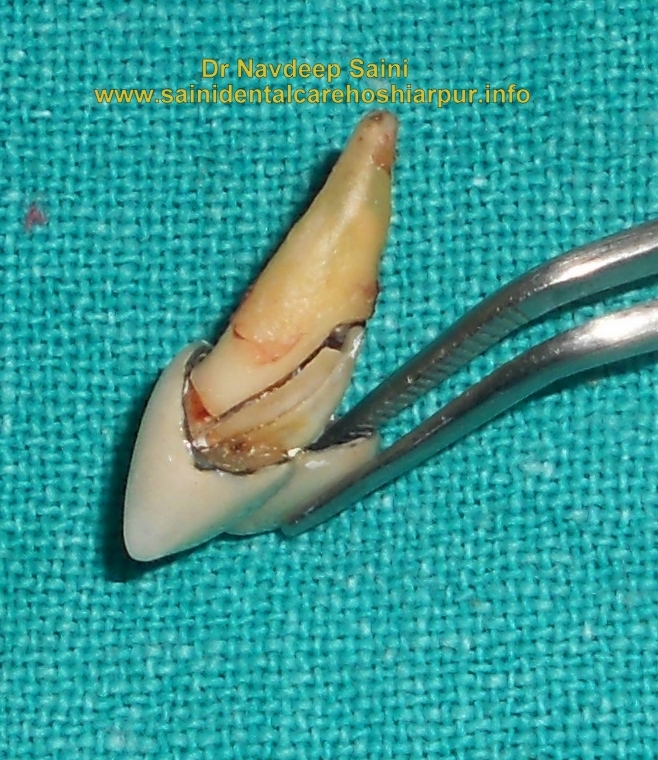 Patient has missing Left Lower First Molar -36- JSG . 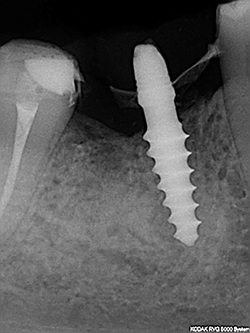 Nobel Biocare Select Tapered Implant Placed in 36 region & Cover Screw Attached - JSG . 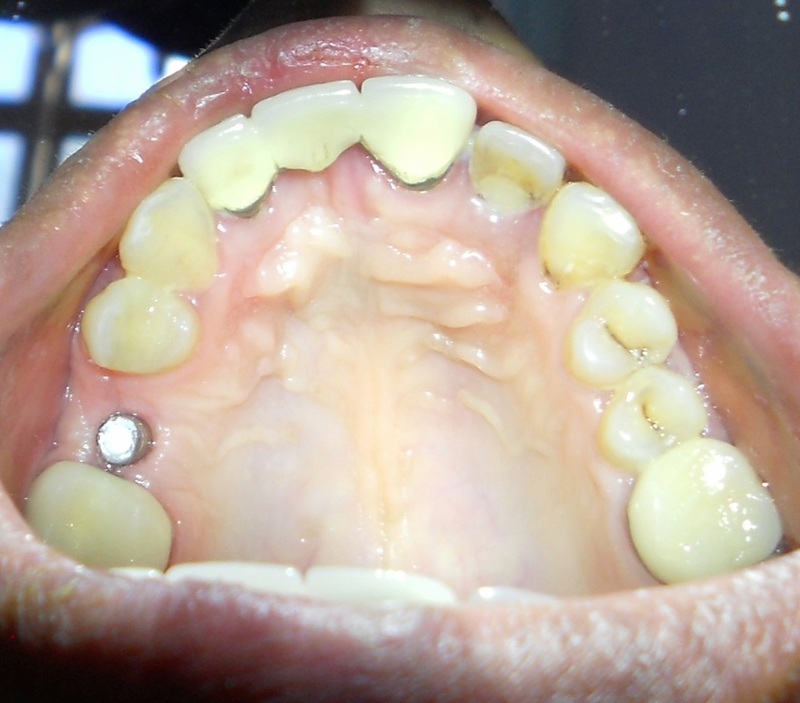 Abutment Attached to Implant after four months- JSG . 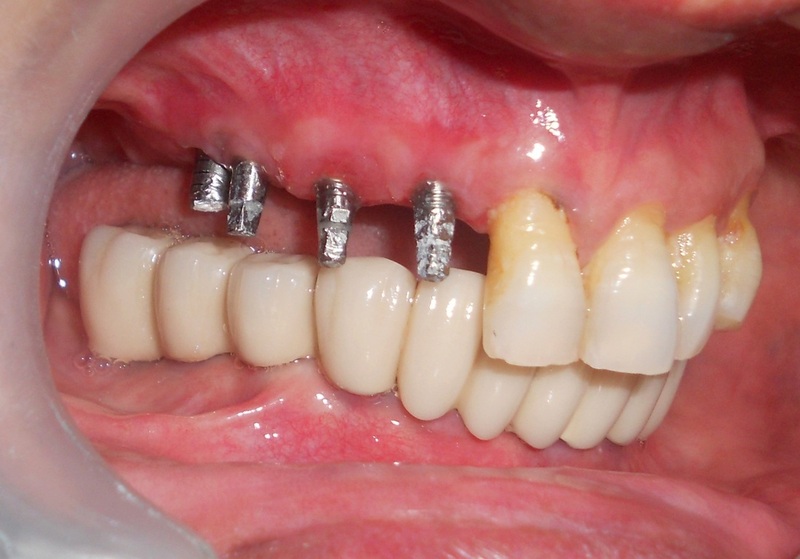 Metal Ceramic Crown cemented - JSG . Picture of Abutment - JSG . Another View of the abutment - JSG. Metal Ceramic Crown Attached - JSG . 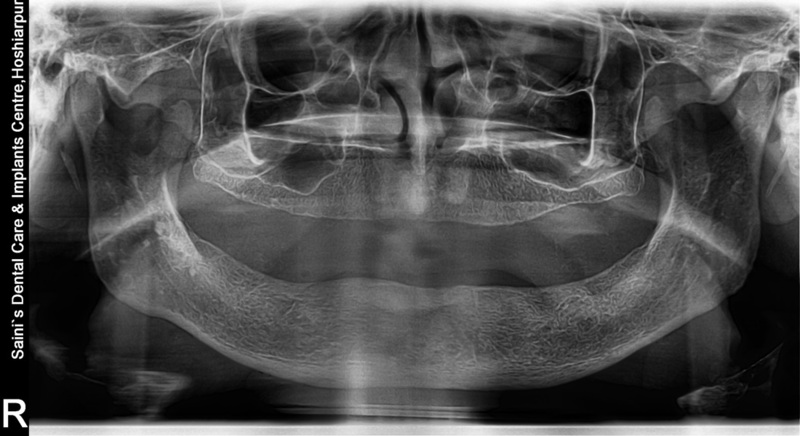 Another View - In Occlusion - JSG . A Picture from Pushpa Gujral Science City , Kapurthala . Missing Left Central Incisor . 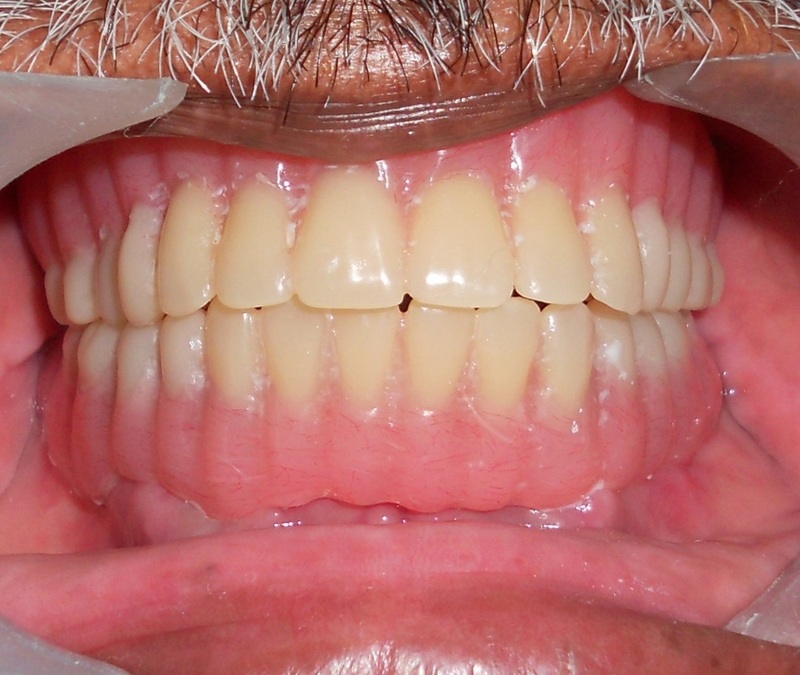 Patient was wearing a removable Partial Denture for a long time - VR . Uniti Equinox 3.7x13mm Implant Placed & cover Screw Attached -VR. Abutment Attached after 4 months -VR. A View of the Abutment - VR . Metal Ceramic Crown with cervical Pink Cearmic Cemented . 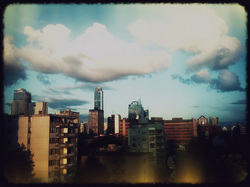 View with a forced smile - VR . View with normal smile - VR . Sundram -B-2/ 147 Civil Lines , Hoshiarpur . Pre Operative Picture . 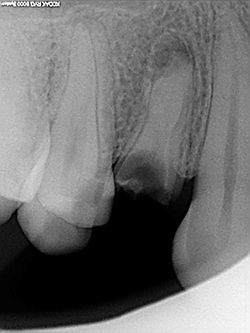 Missing Right Lower First Premolar-44 . Poor fitting 45-47 Metal Ceramic Bridge - KS . 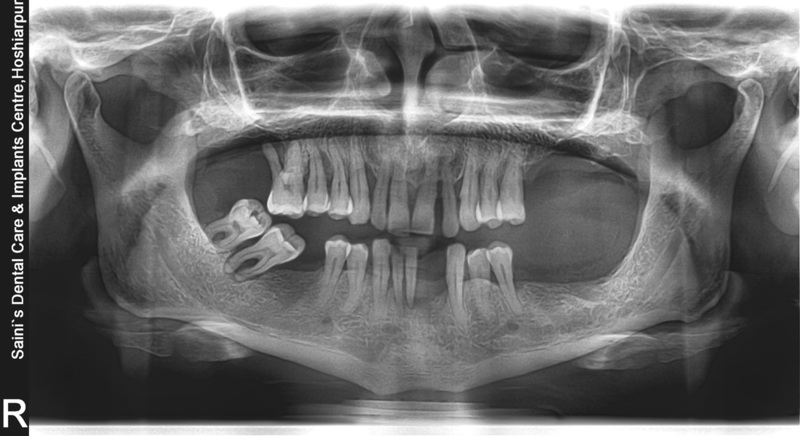 Pre Operative X Ray of 44 Region - KS . 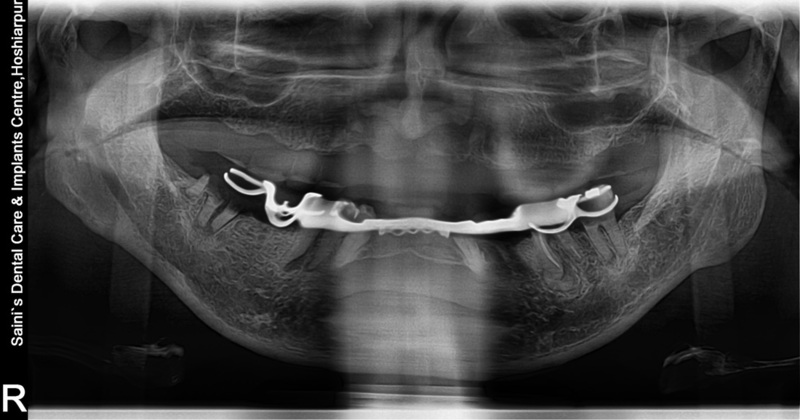 Pre Operative OPG. 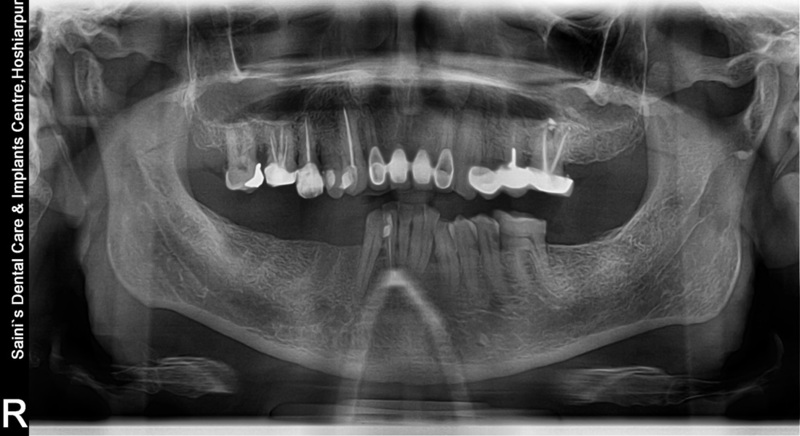 Missing 44, 36 Mesio Occlusal Deep Caries - KS . 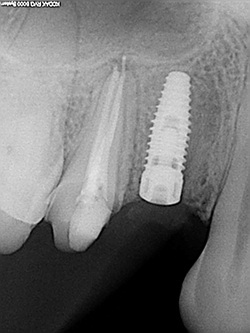 One Piece KOS 3x12mm Implant was placed . 45-47 Bridge was Removed - KS . 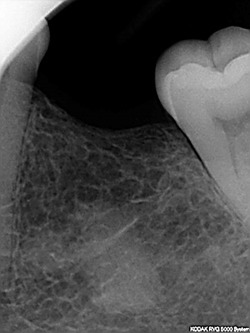 X Ray of 44 Region after Implant placement - KS . 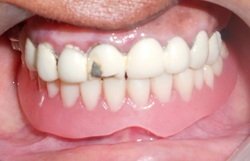 44,45-47 New Metal Ceramic Bridge Cemented - KS . Another View of 44,45-47 Metal Ceramic Bridge - KS . Carving of Teeth in a soap by Mr Gulzar . 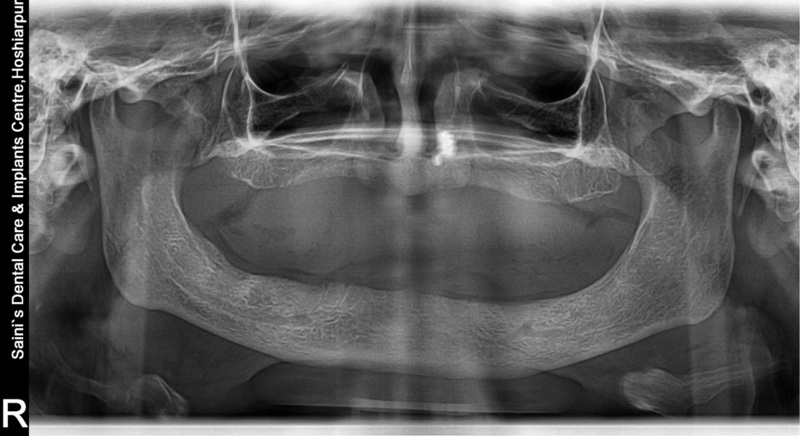 OPG revealing maxillary sinus floor dipping in 16 region . 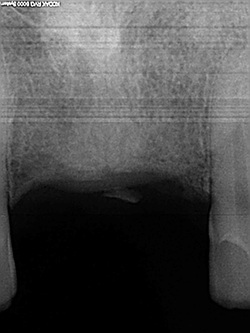 RK - Post Implant Placement X Ray . 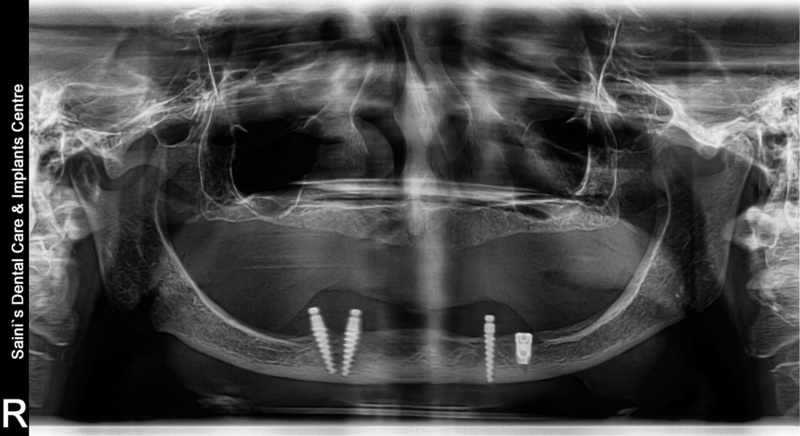 TSS - Post Operative OPG shows three Single Piece KOS Implants on both Right & Left Sides . 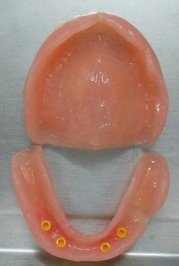 JSP - TWO Single Piece KOS Bendable Implants placed . 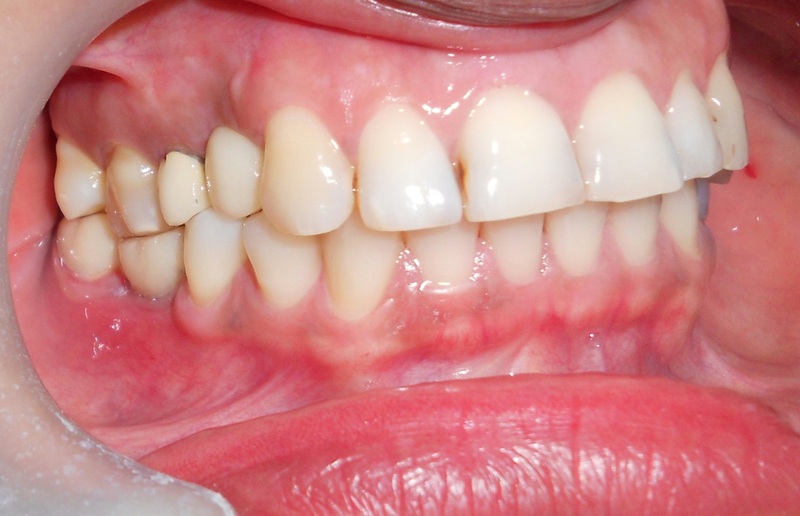 JSP - Smile after permanent crowns placed . 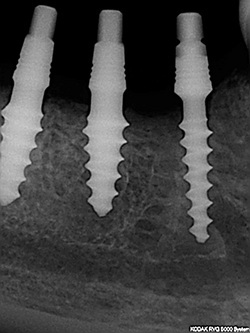 JSB - Post Implant Placement X Ray shows two KOS Single Piece Implants . JSB- Post Permanent Crown placement picture . 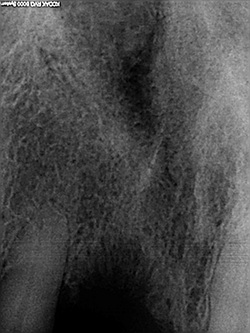 X Ray of Missing 36 region with mesial tilting of 37 . 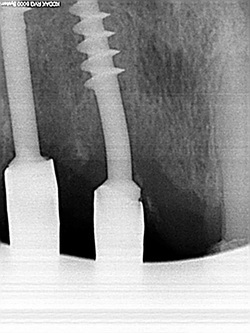 X Ray of Single Piece KOS Implant in 36 region . Dr Navdeep Saini - About to Enjoy a Helicopter Ride in Orlando , Florida ,USA , October 2010 . 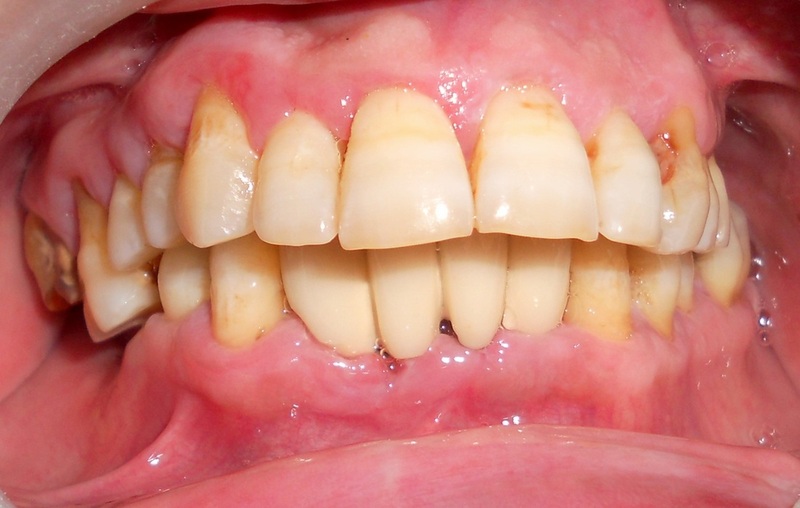 Pre Treatment Picture - Missing lower Central Incisors . 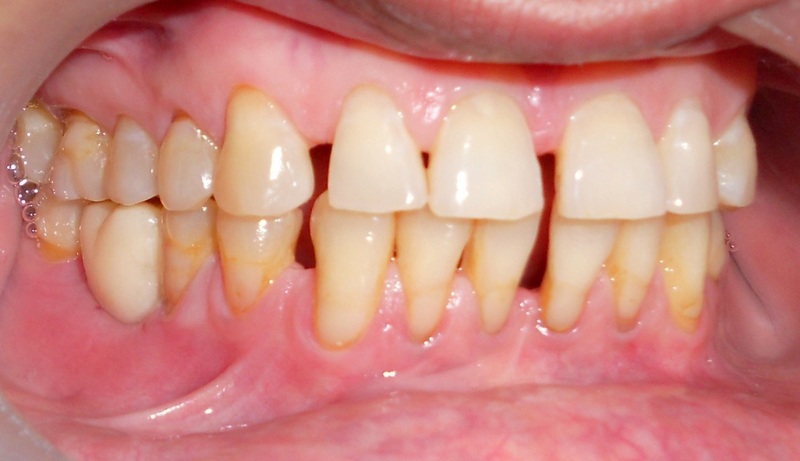 Lateral Incisors are Grade III Mobile . 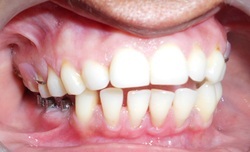 Patient already wears a two teeth removable partial denture, but, does not want another partial denture with four teeth . Pre Treatment X Ray . Lateral Incisors Extracted . 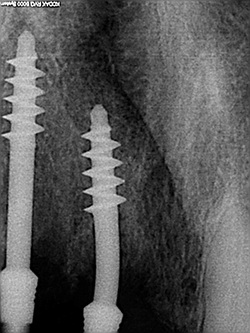 Two BCS Implants 3.5x14 mm placed immediately in their sockets . 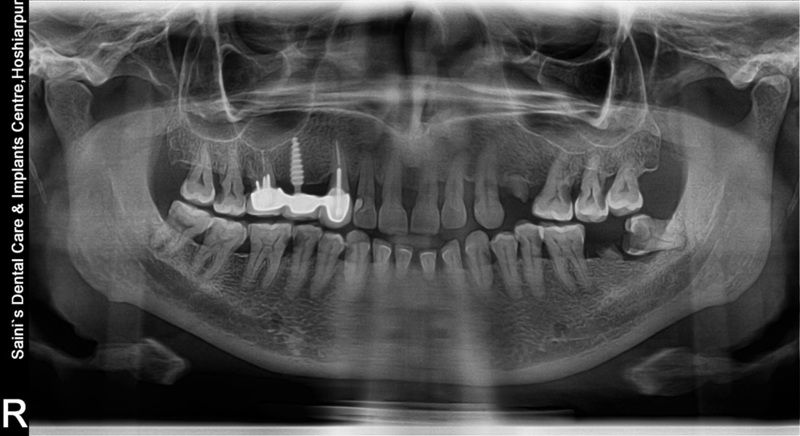 Post Implant Placement X Ray . Heat Cured Acrylic Resin Bridge cemented . 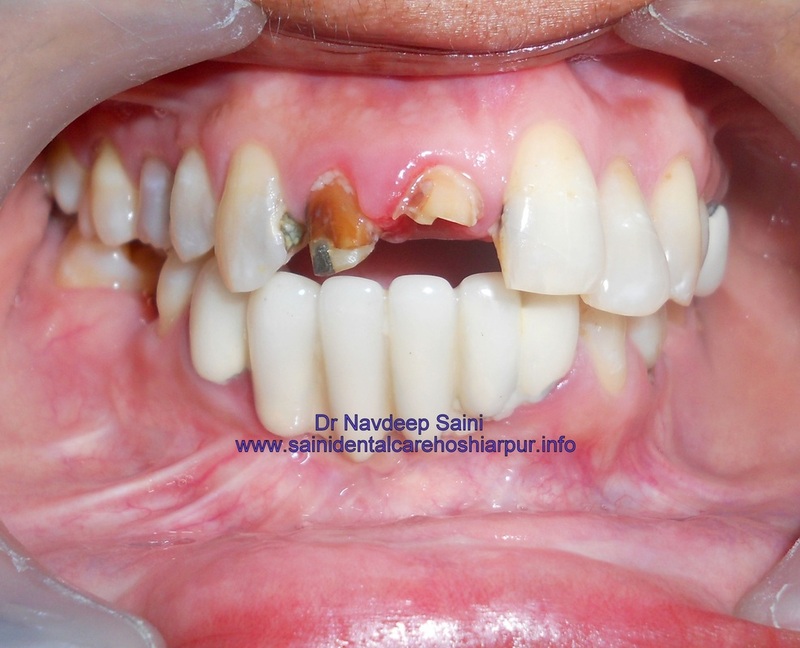 This lady patient was using a lower full denture for the last 4 years ,but, did not feel comfortable as the denture would keep on moving, causing frequent sore mouth & she could gulp only semisolid food . 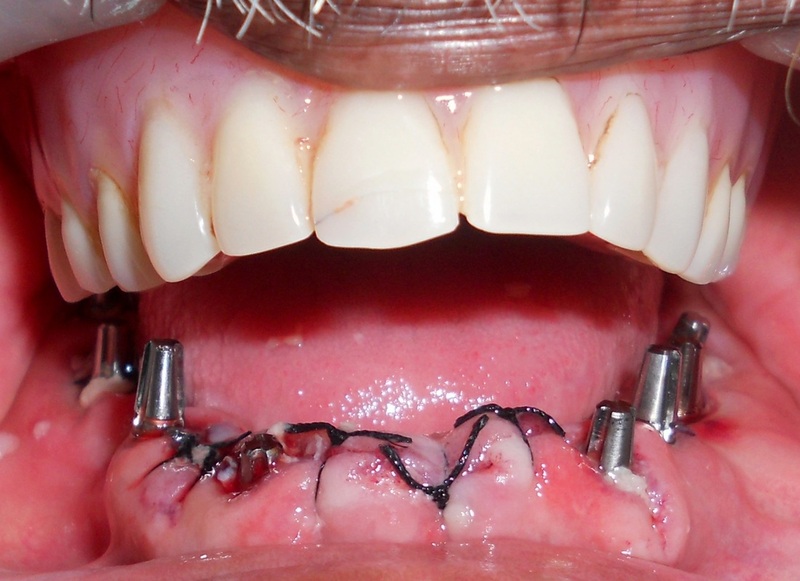 Four single piece KOSK Ball Implants were placed in lower jaw & Nylon Caps picked up in the existing denture . Now she is totally comfortable with the denture & enjoys eating whatever food that she wants to eat . 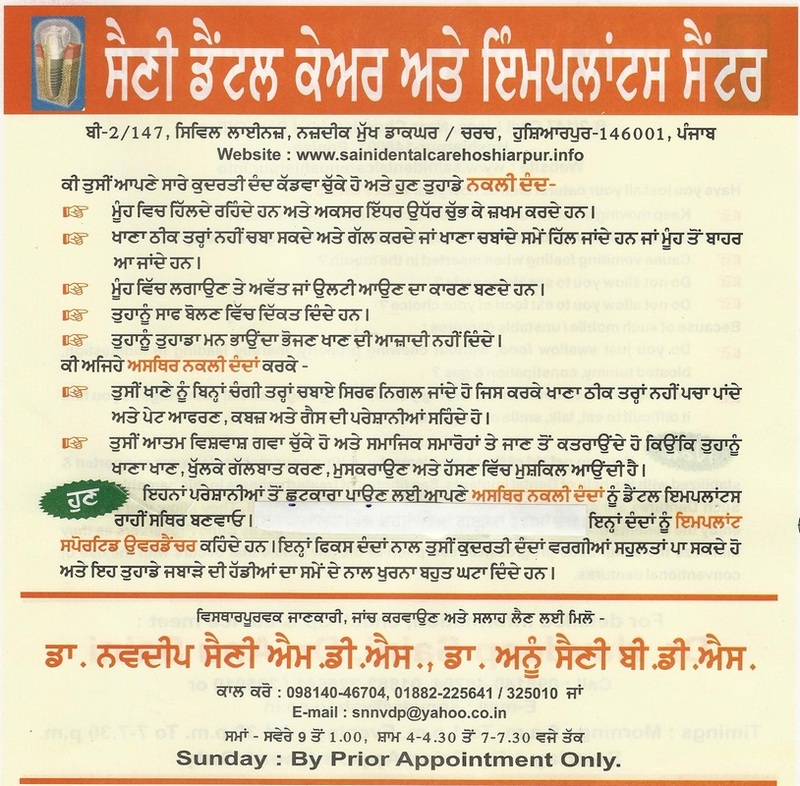 Please note: This website has been designed by Dr Navdeep Saini, without professional help from any quarter. Suggestions from visitors are welcome.